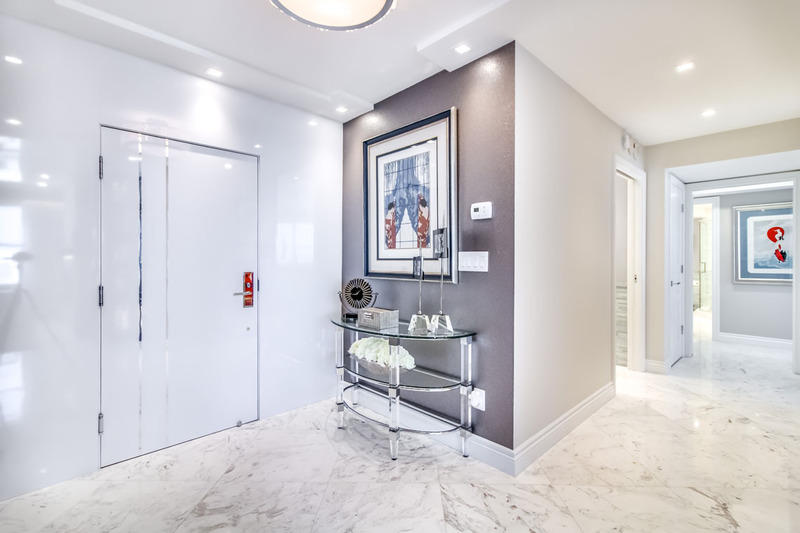 All new solid-core interior doors with new chrome lever door handles. 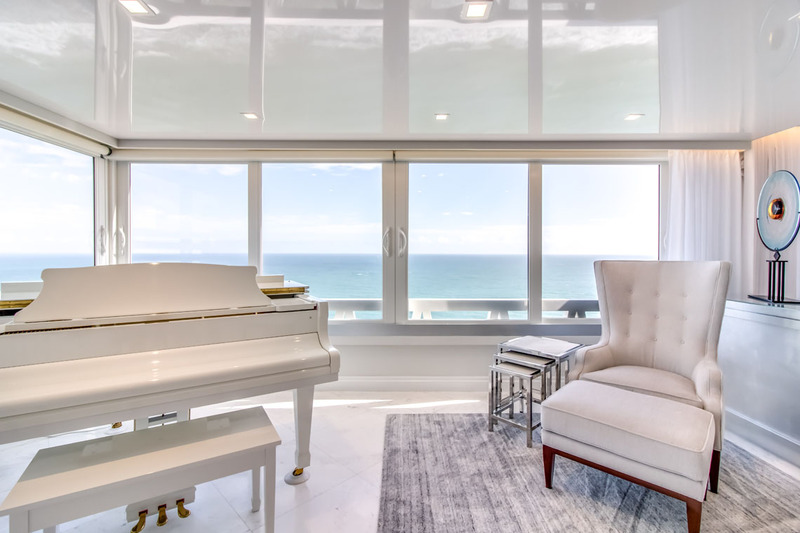 All window sills feature white quartz. 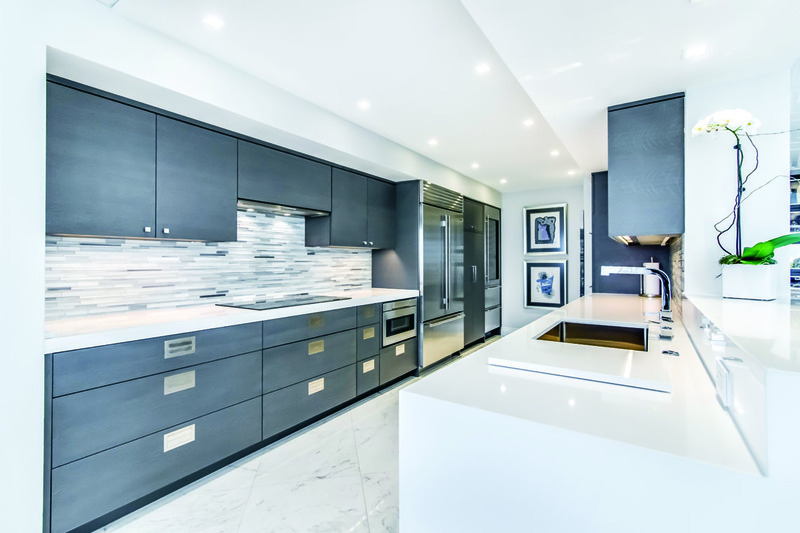 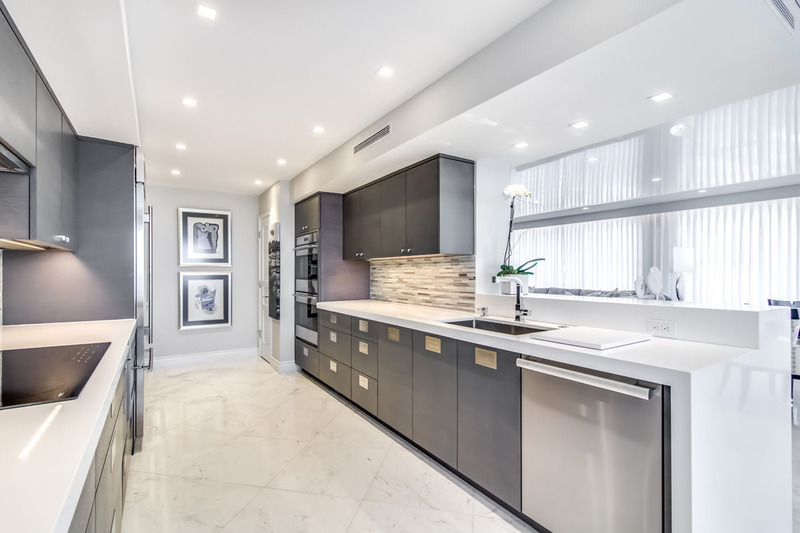 The kitchen also includes high-end Wolf, Miele and Sub-Zero appliances. 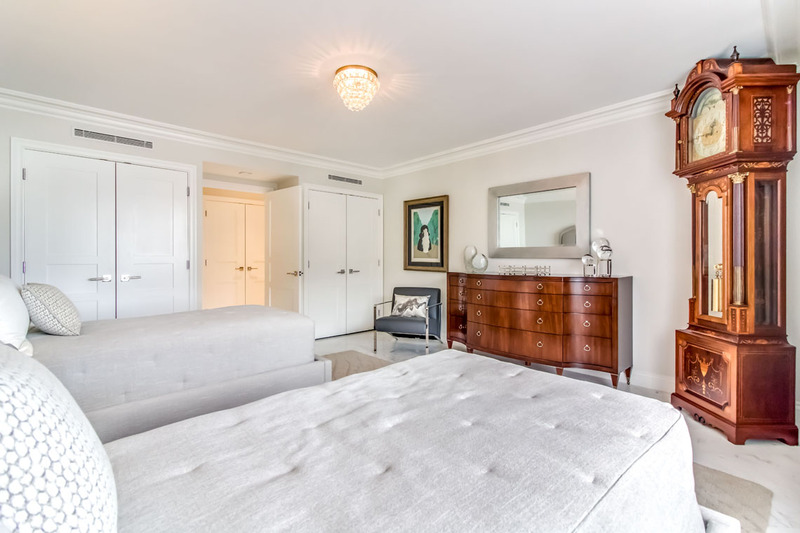 The butler’s pantry was originally the main kitchen of unit E.
The guest bedroom features a shag rug and abstract mirrors. 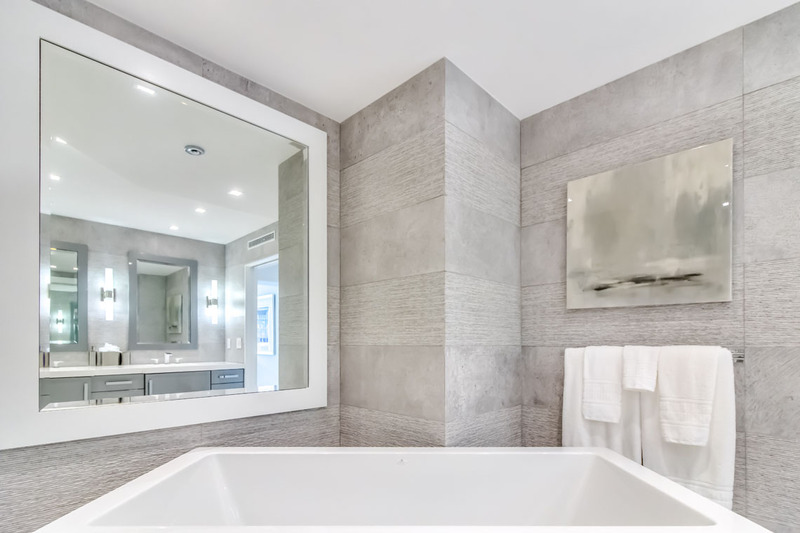 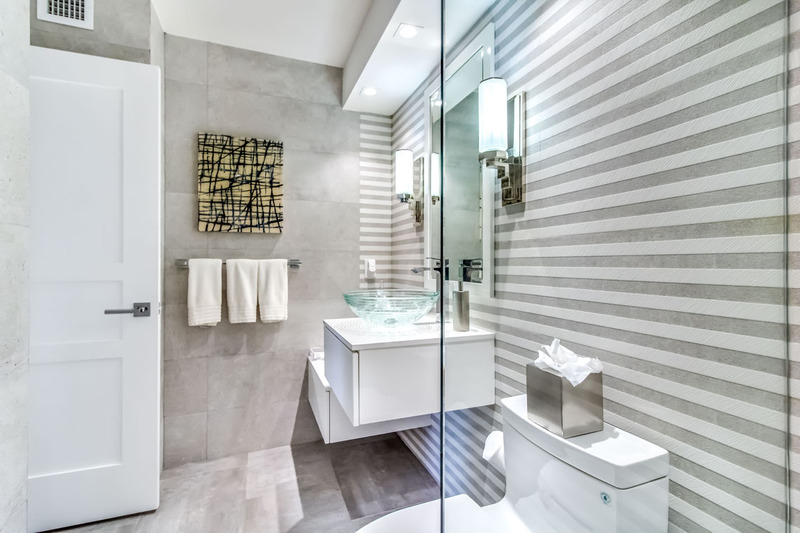 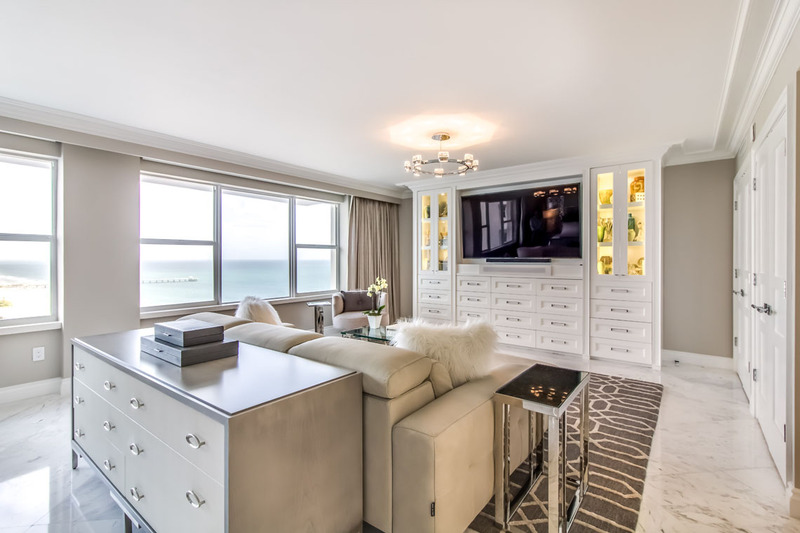 All bedrooms and bathrooms feature new electric wall outlets and wall-mounted cable boxes for the TVs. On a clear day, views from Miami Beach to Lighthouse Point can be seen. 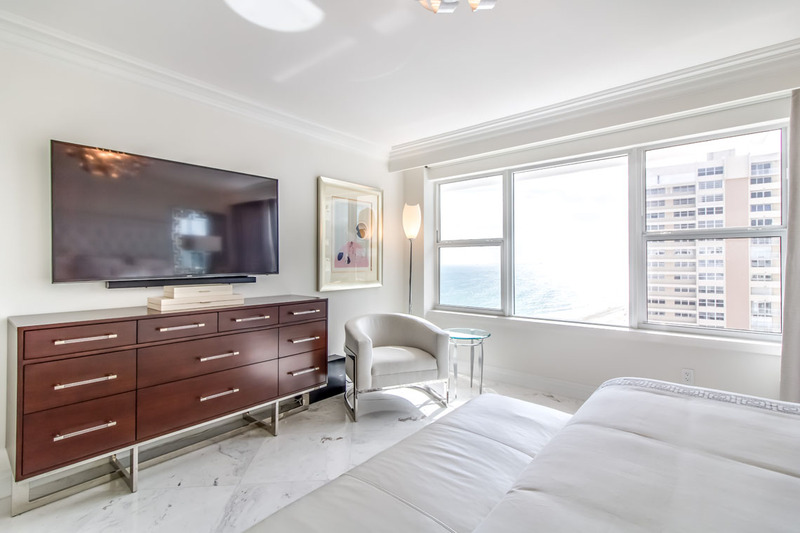 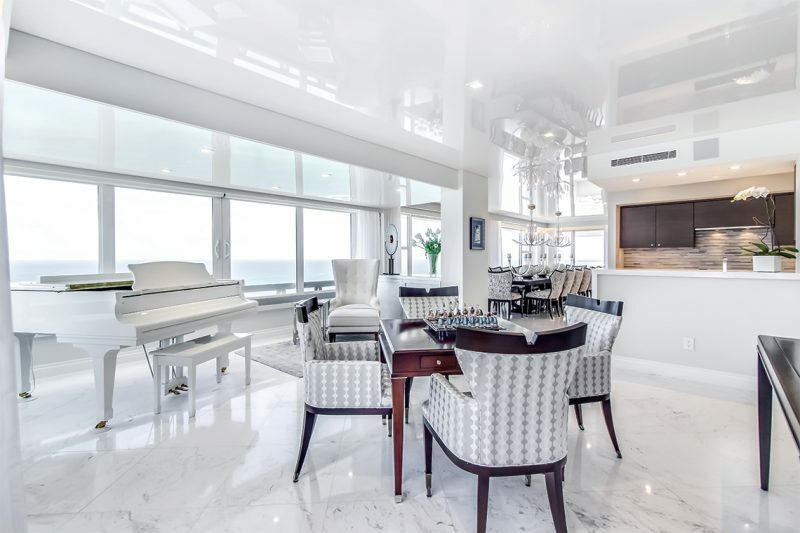 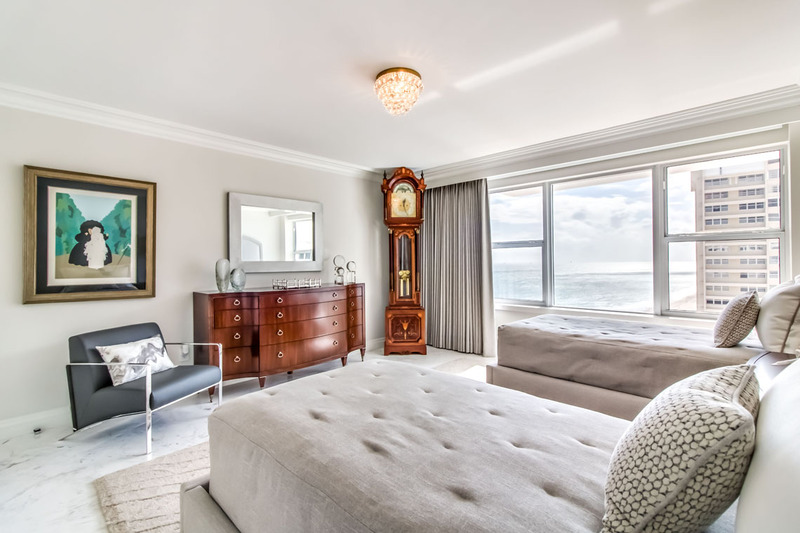 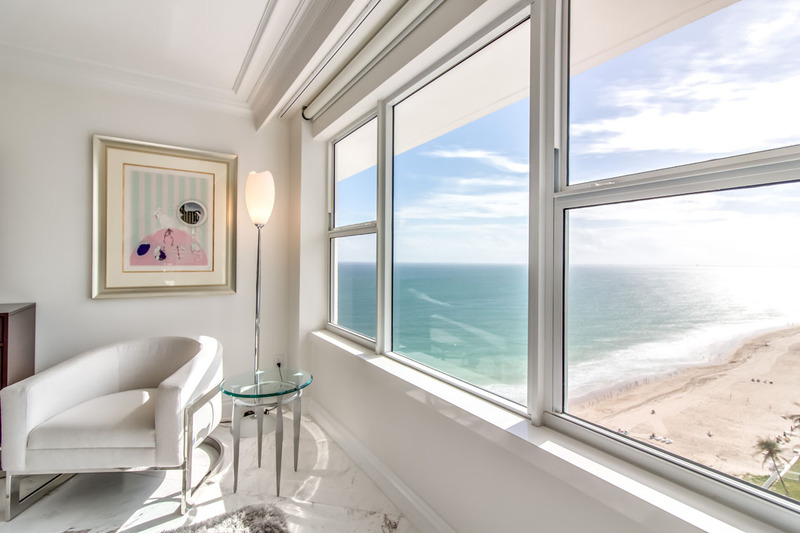 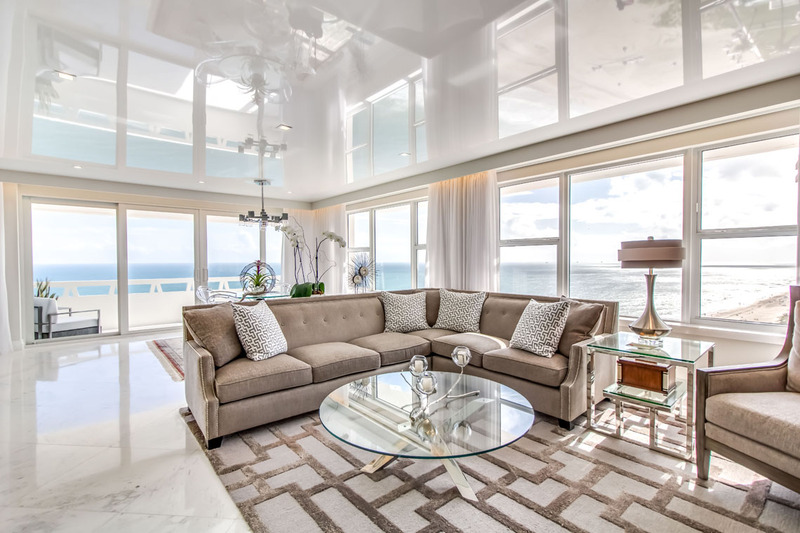 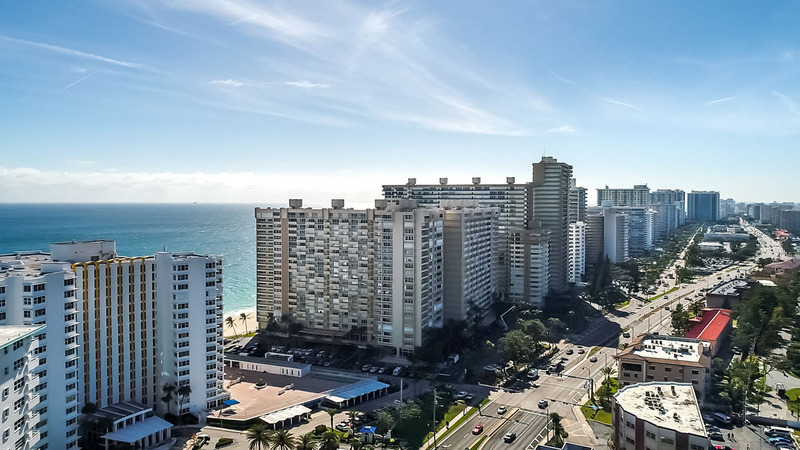 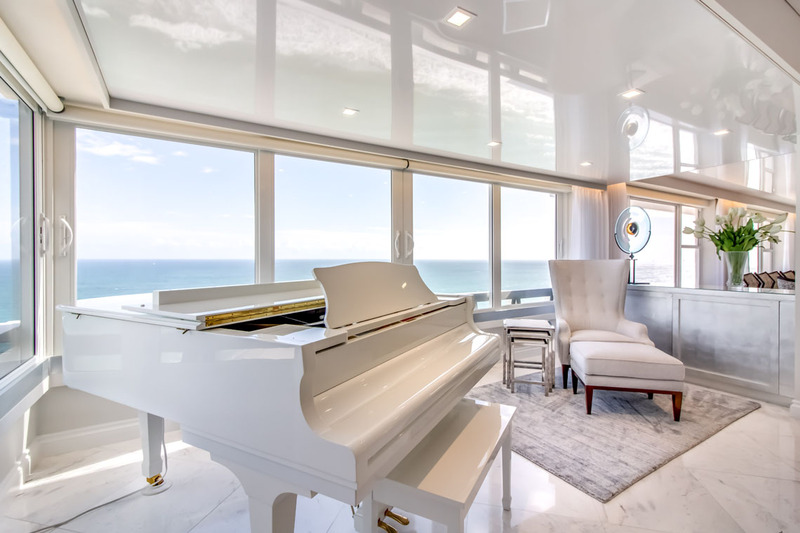 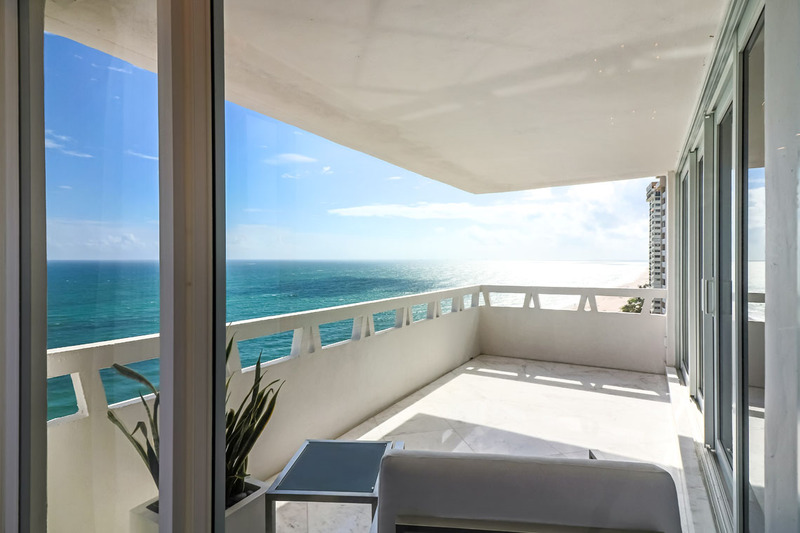 A spectacular ocean view is just one of the advantages of this condo that’s actually two units combined into one luxurious space. 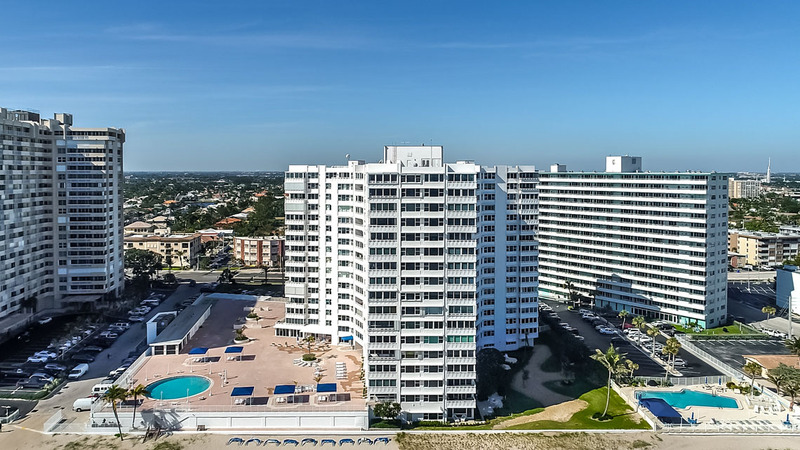 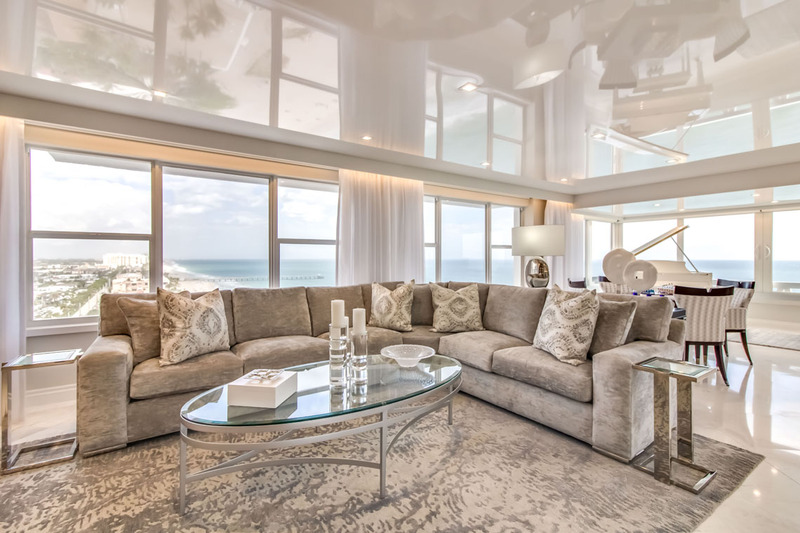 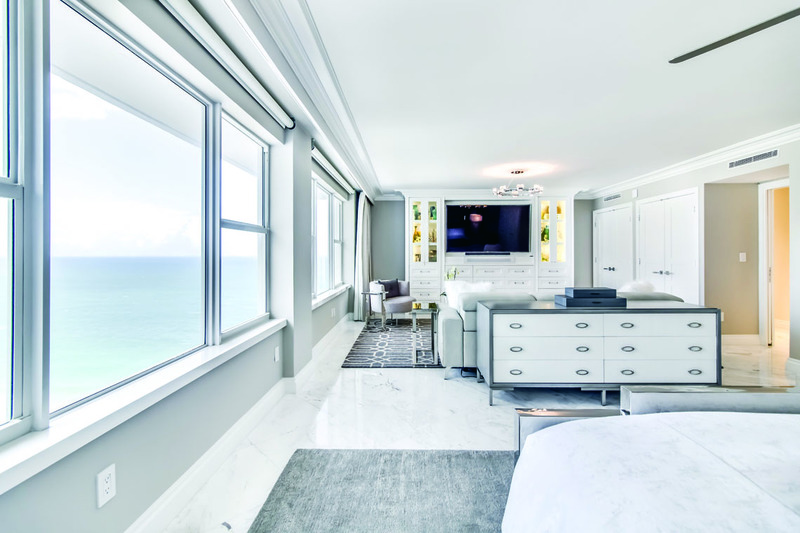 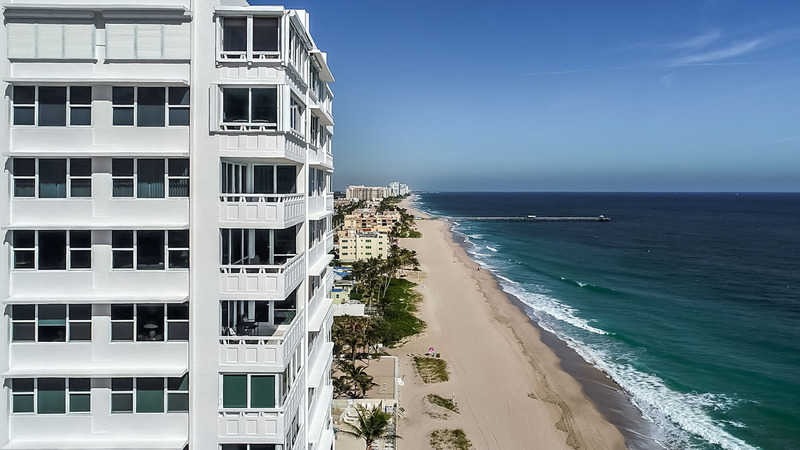 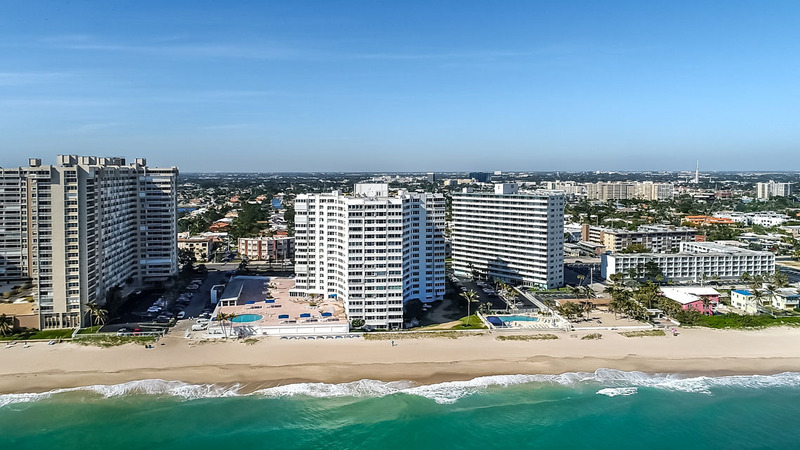 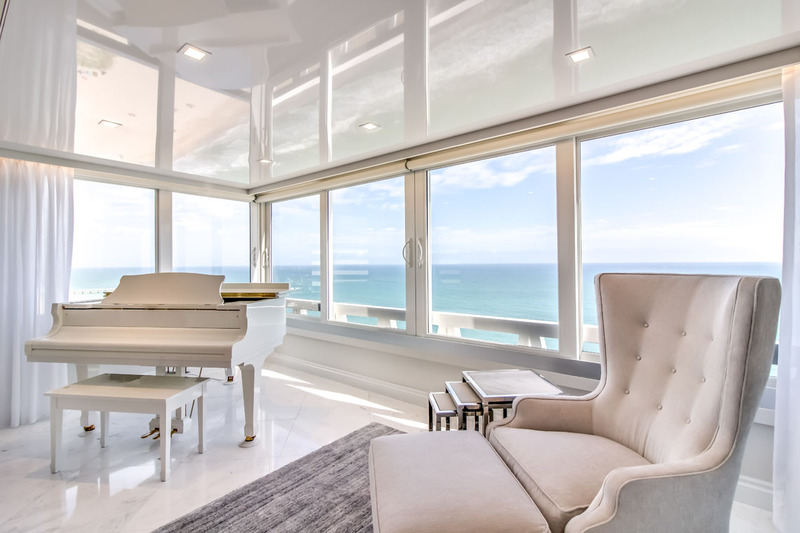 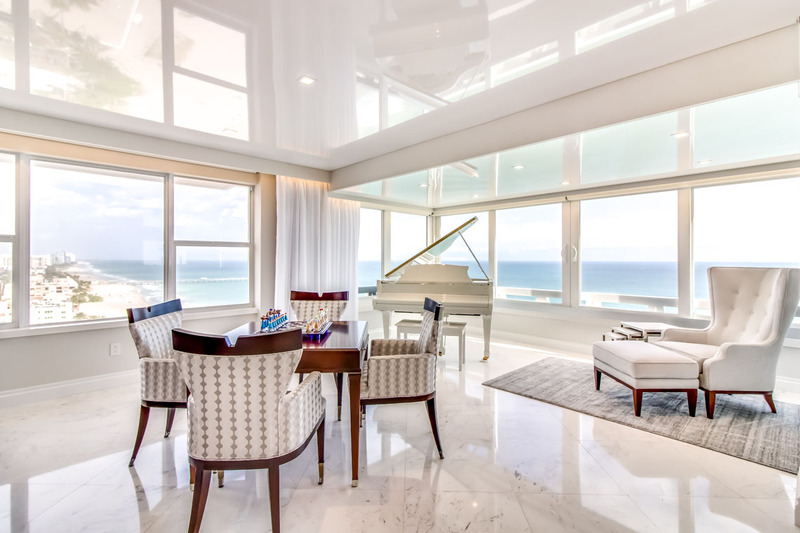 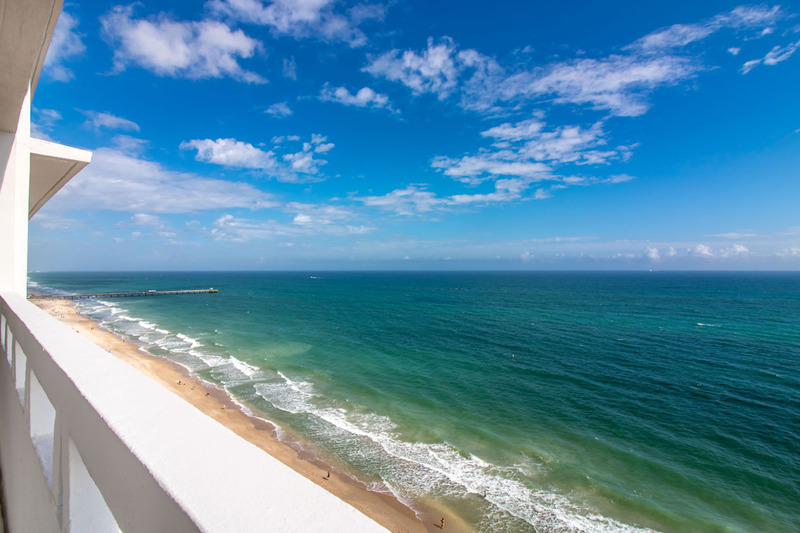 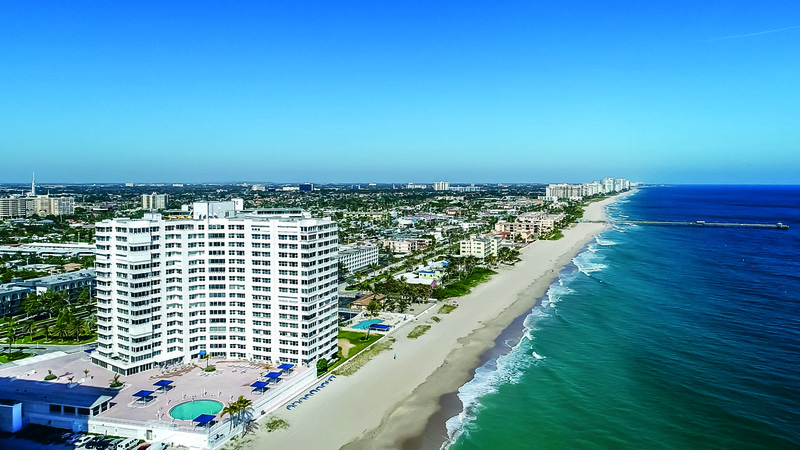 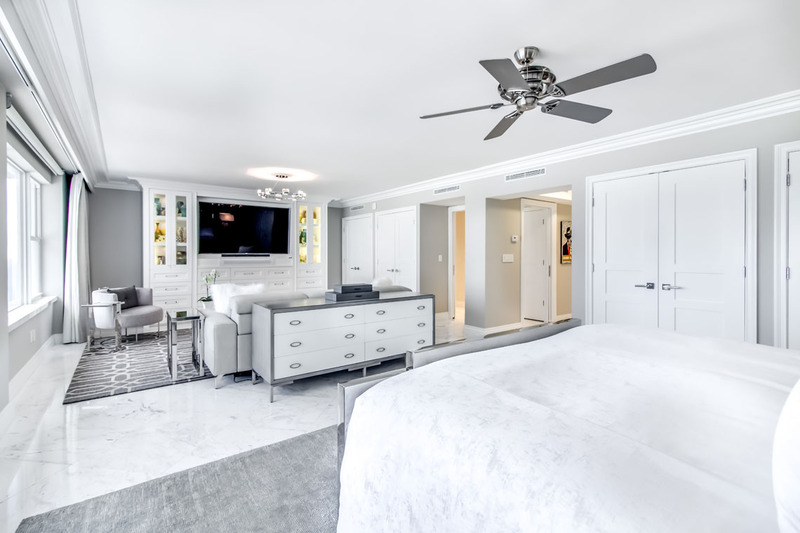 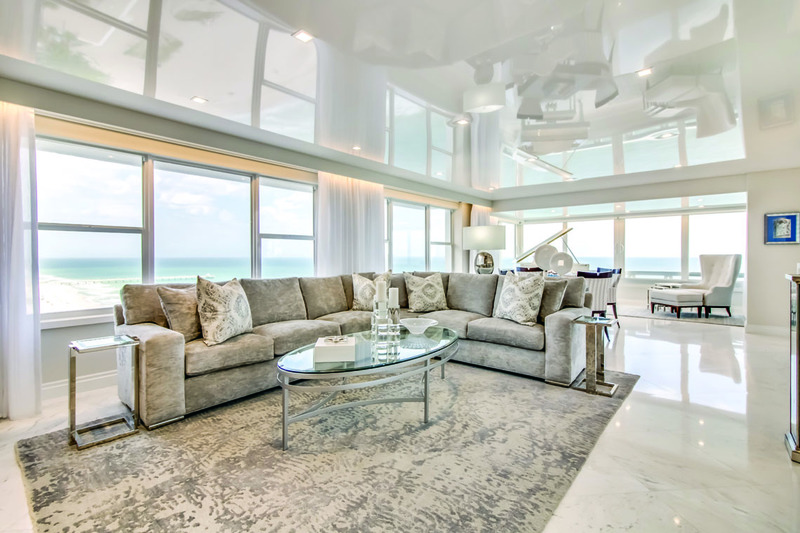 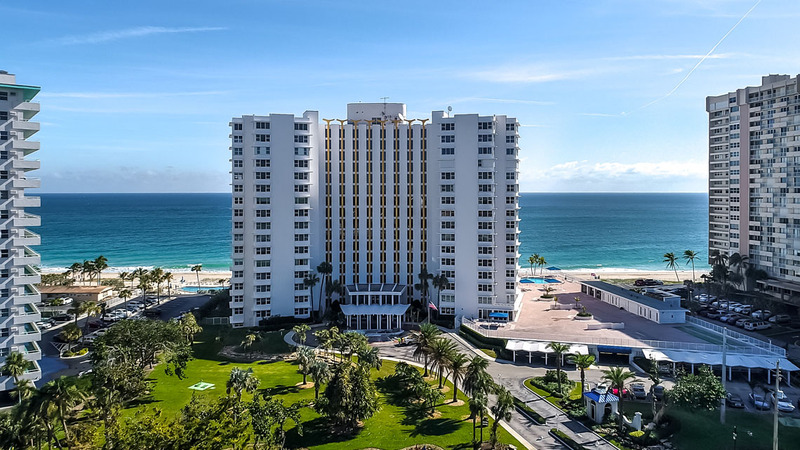 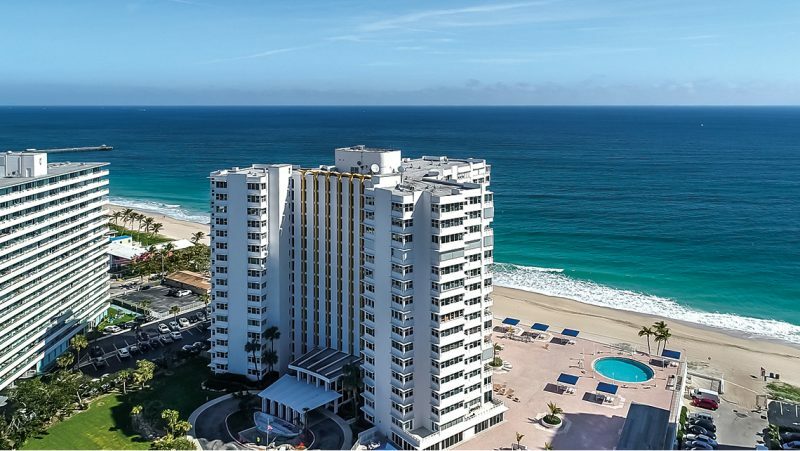 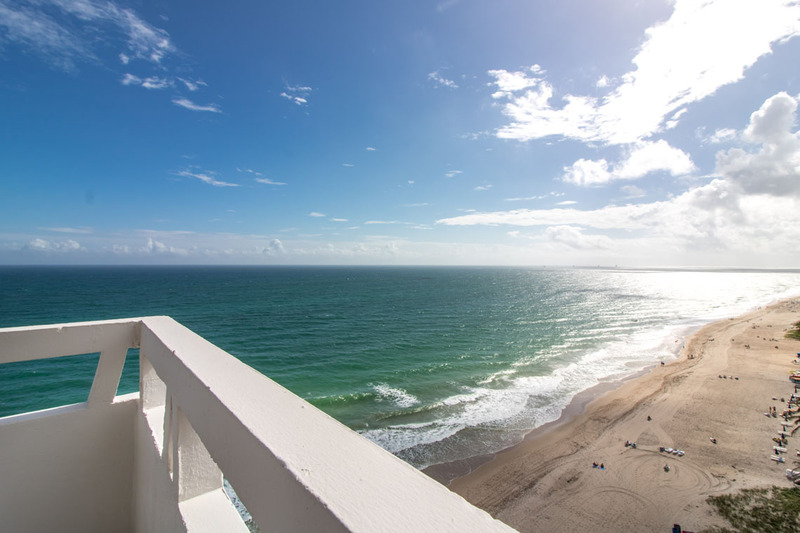 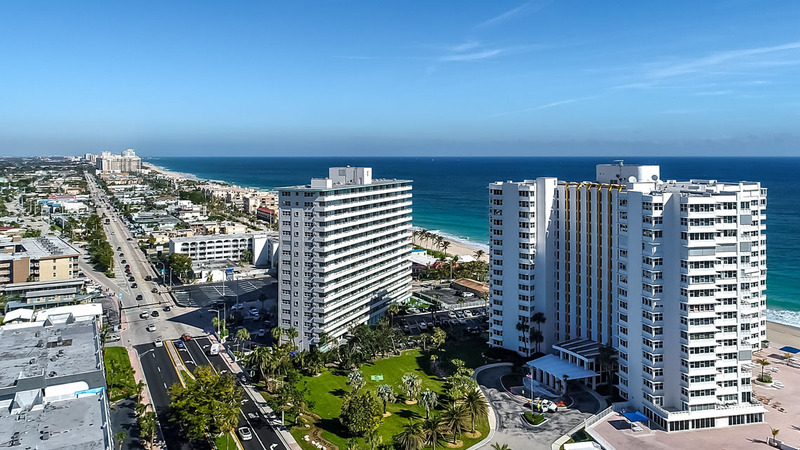 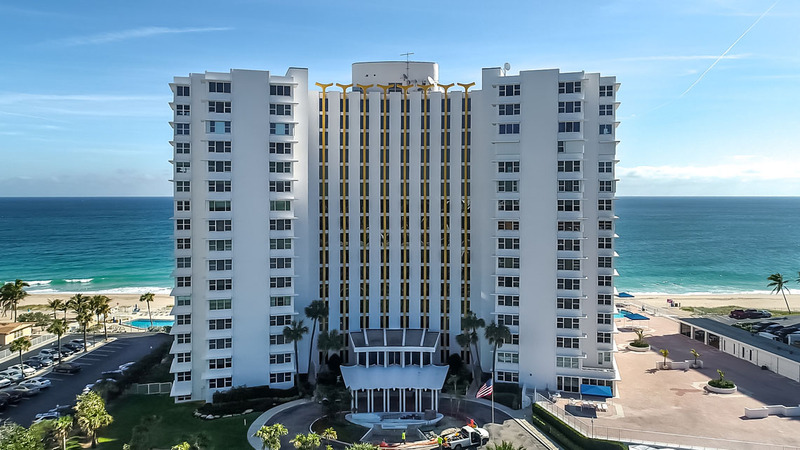 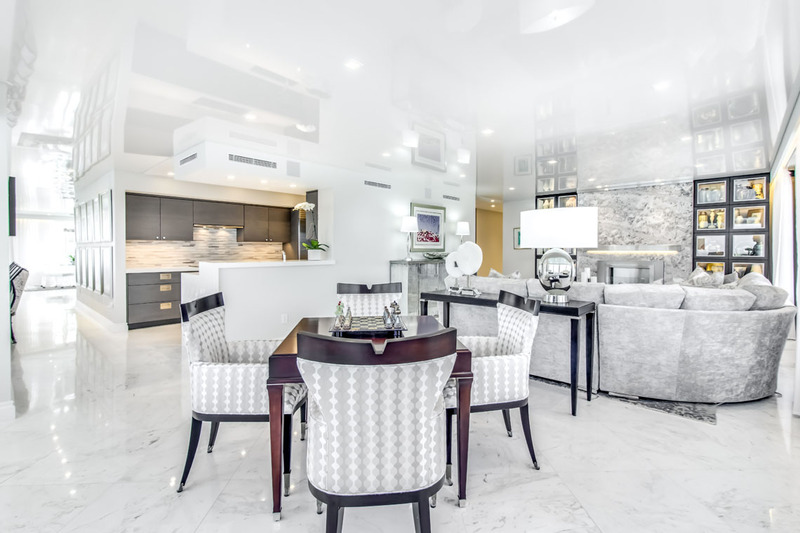 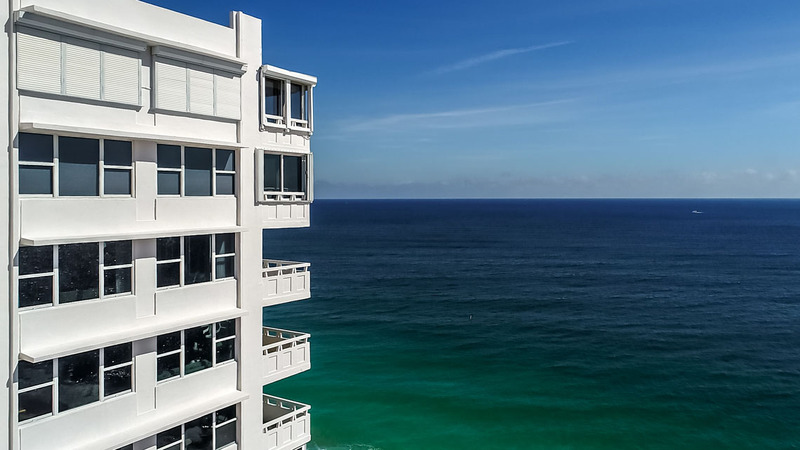 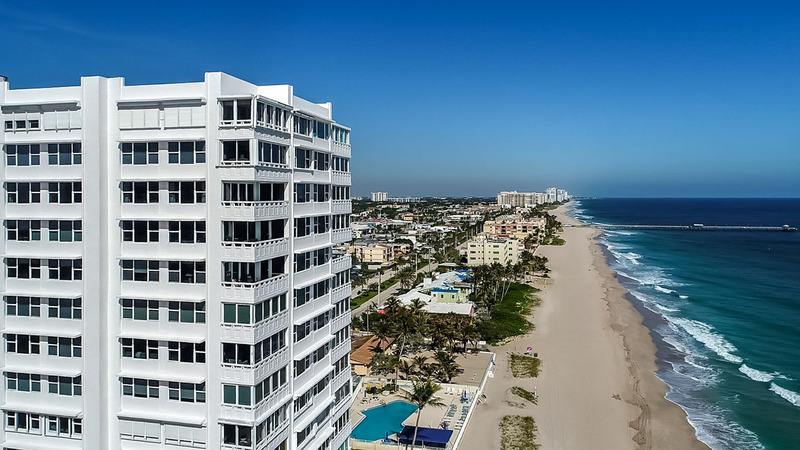 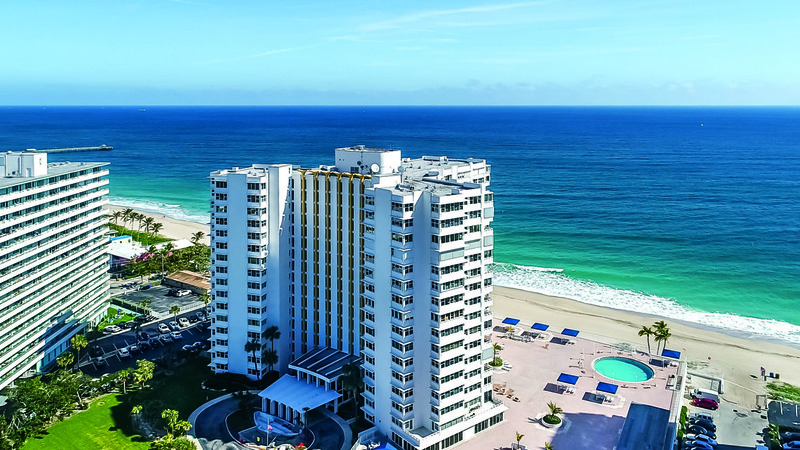 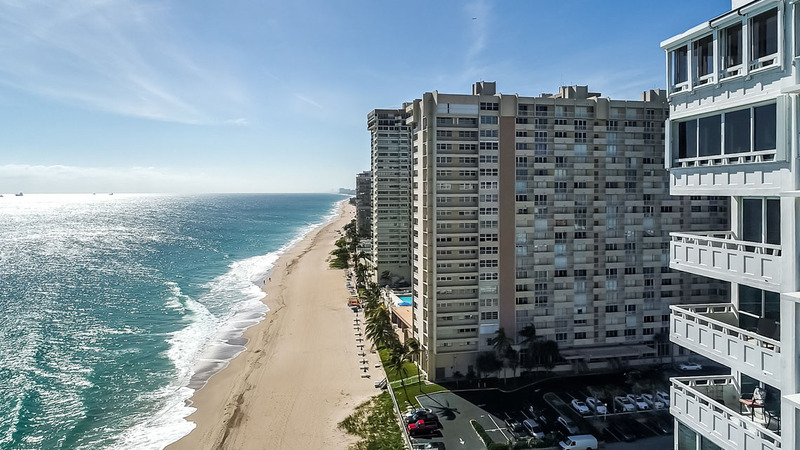 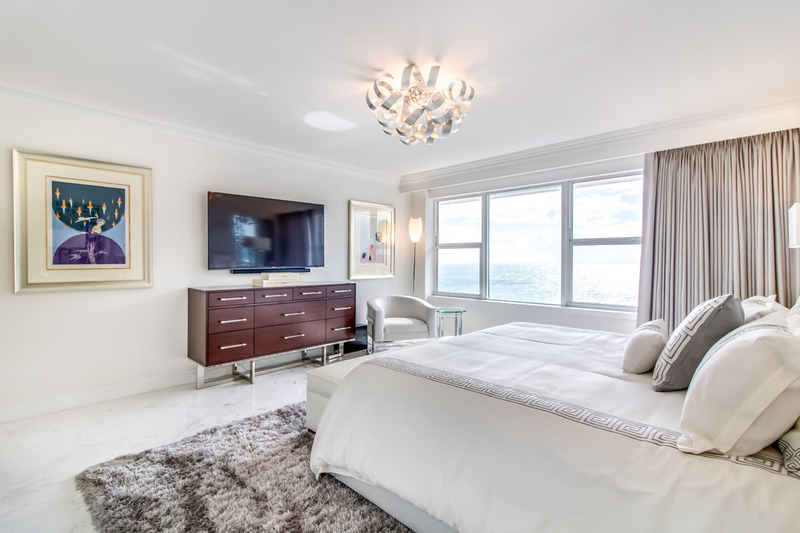 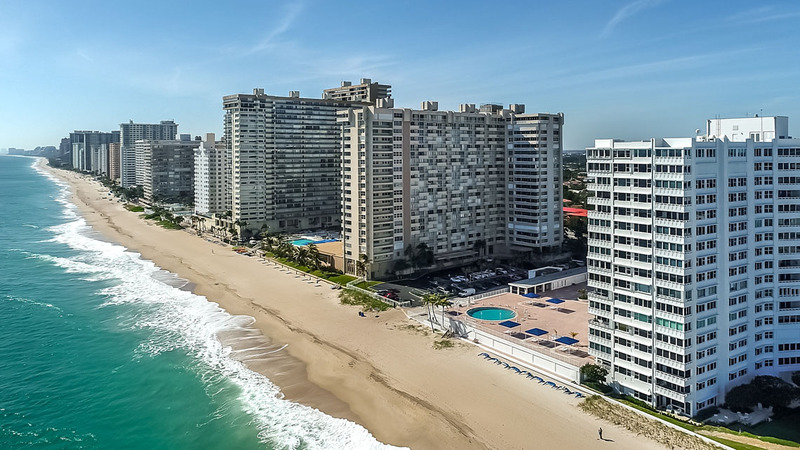 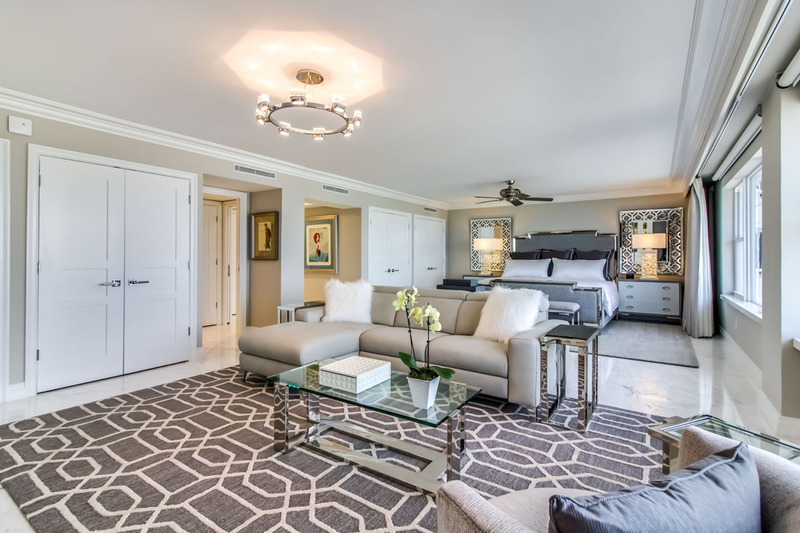 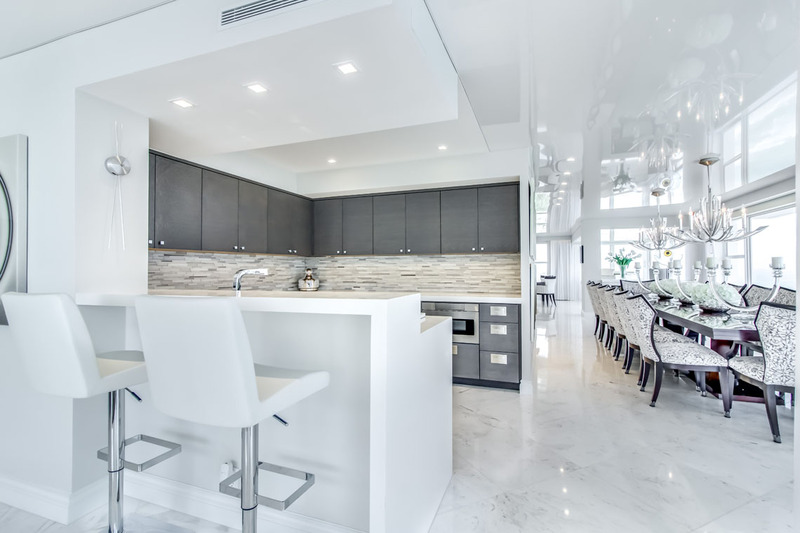 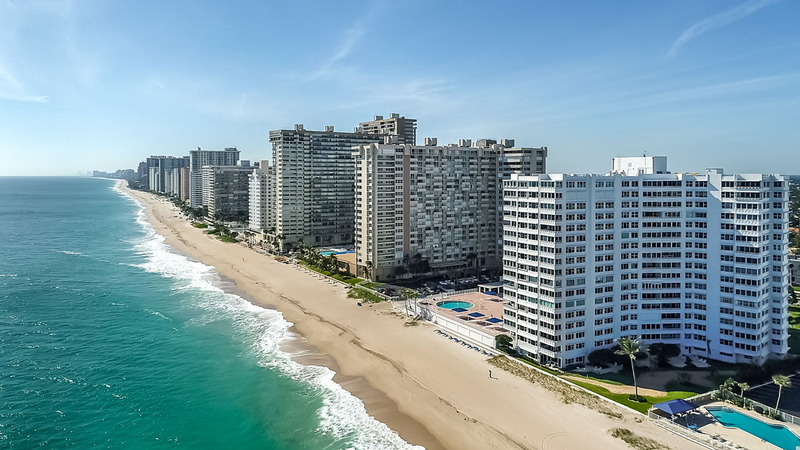 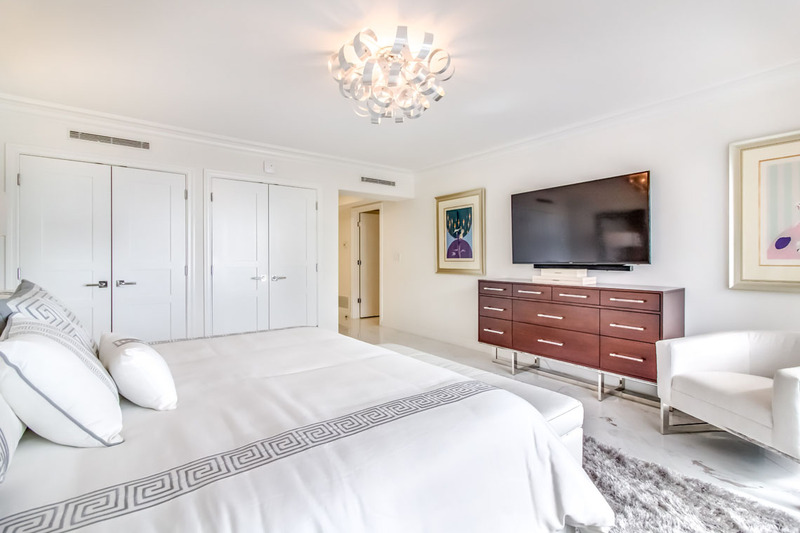 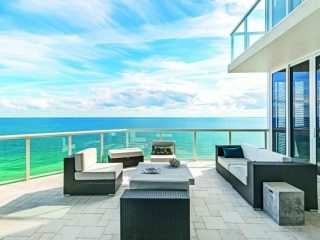 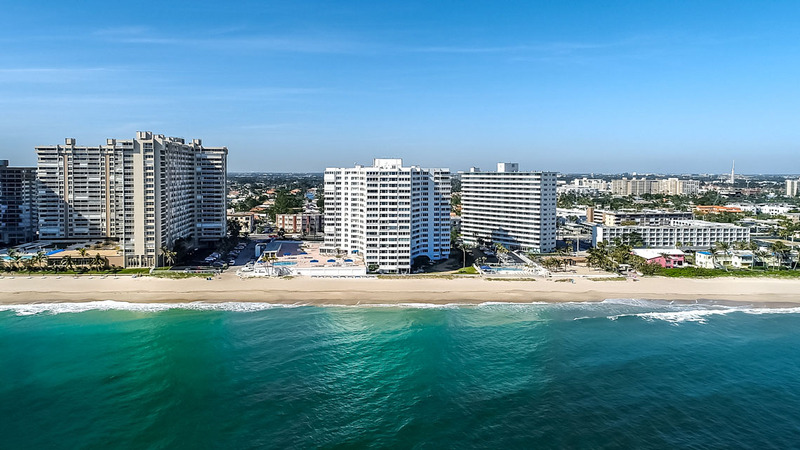 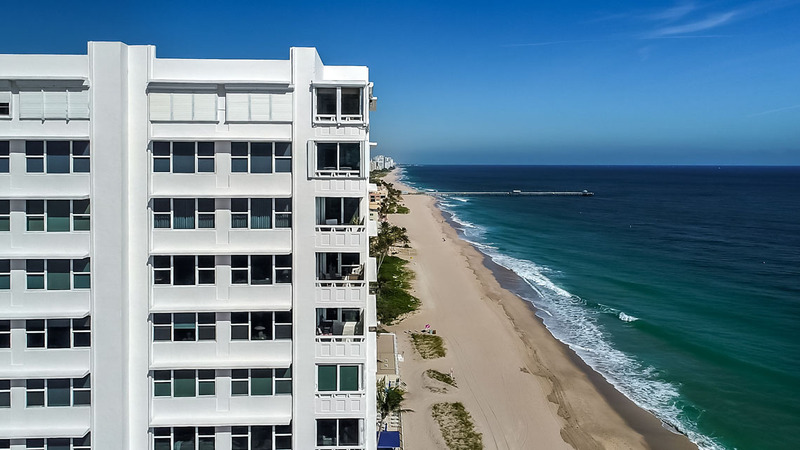 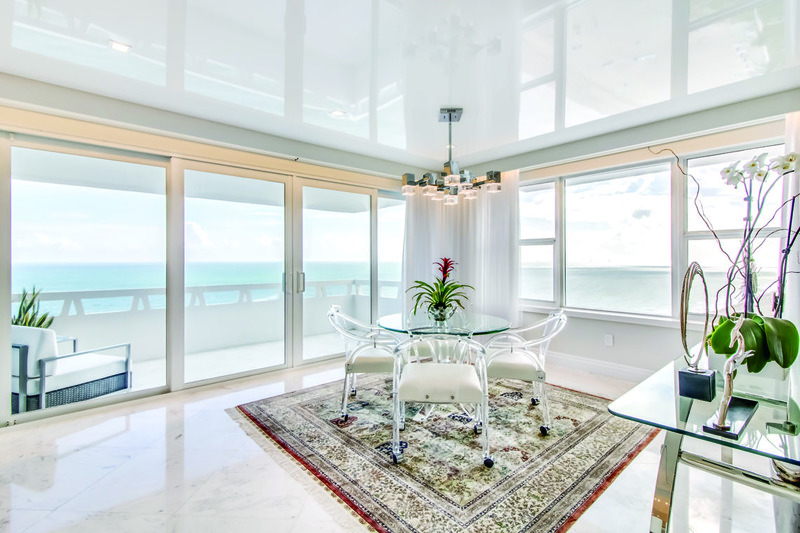 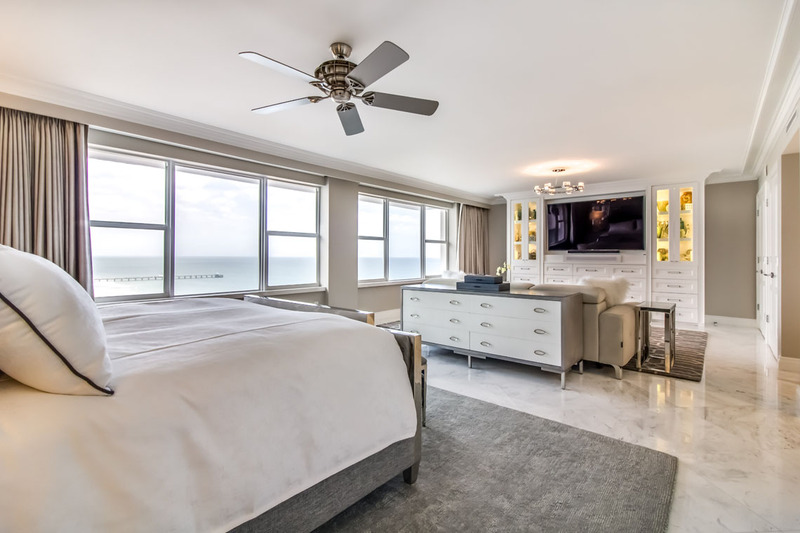 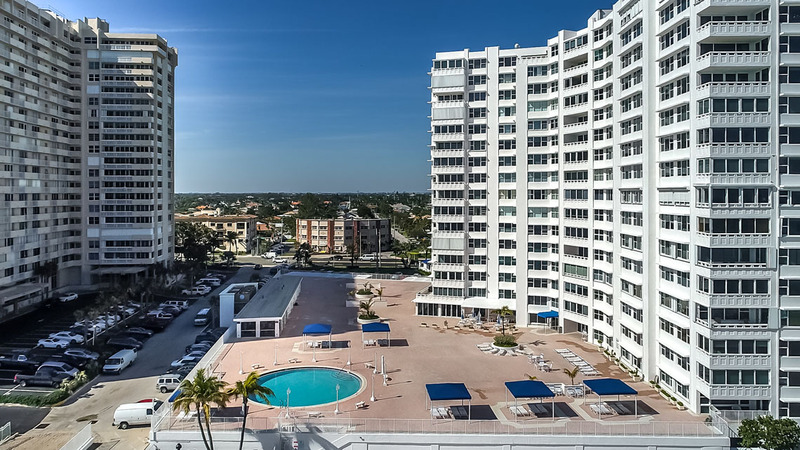 As the largest unit in the Fountainhead condominium in Lauderdale-By-The-Sea, the space combines two bedroom units to create a unique floor plan. 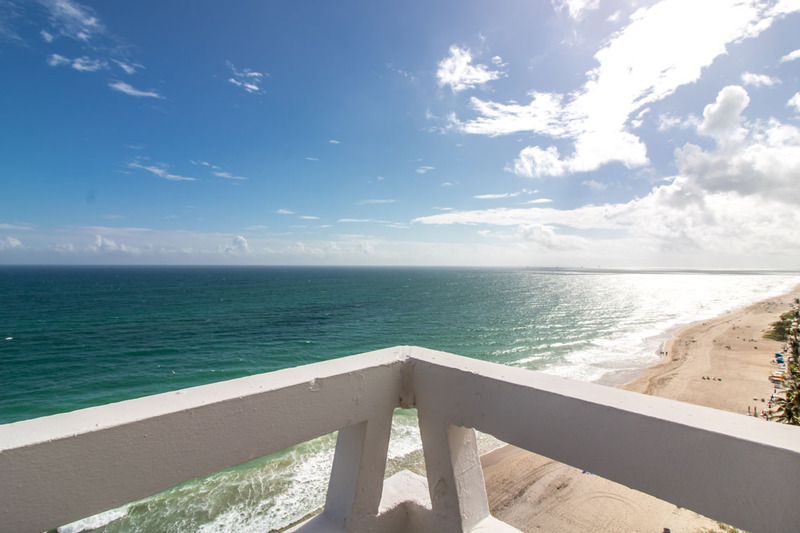 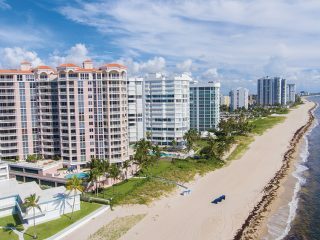 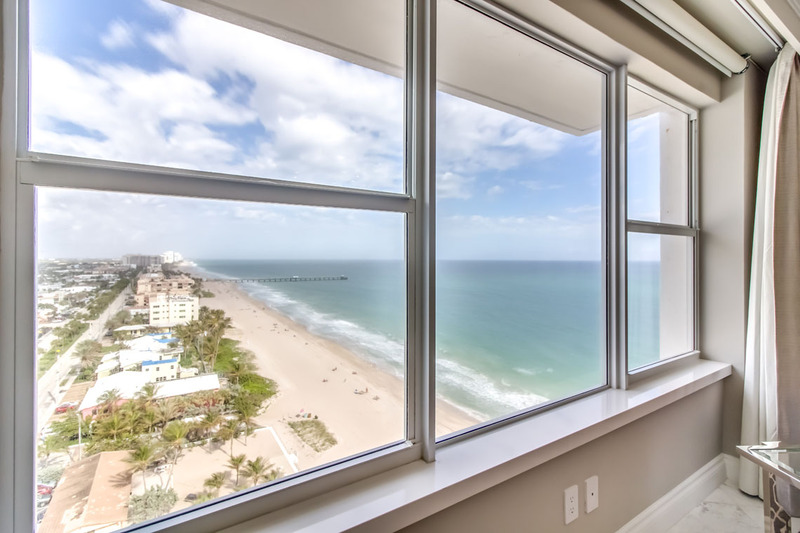 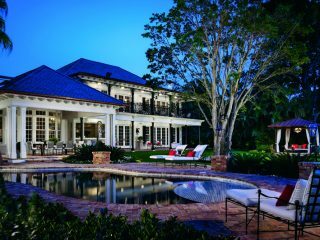 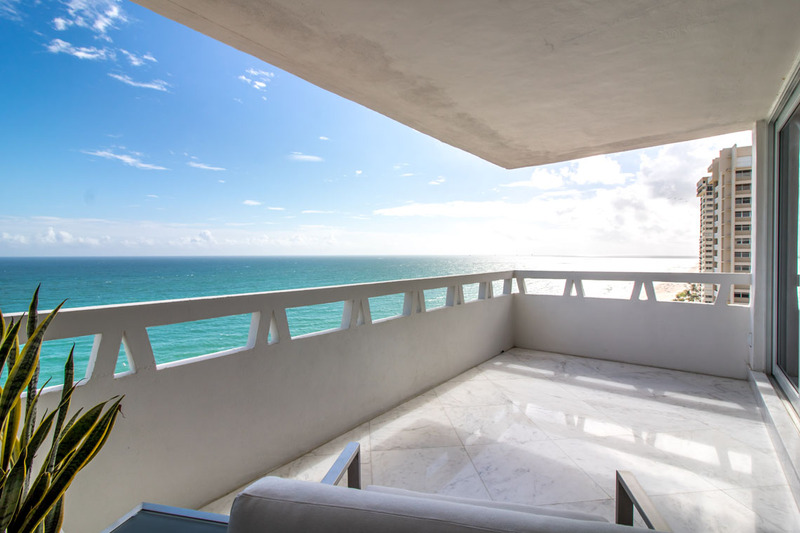 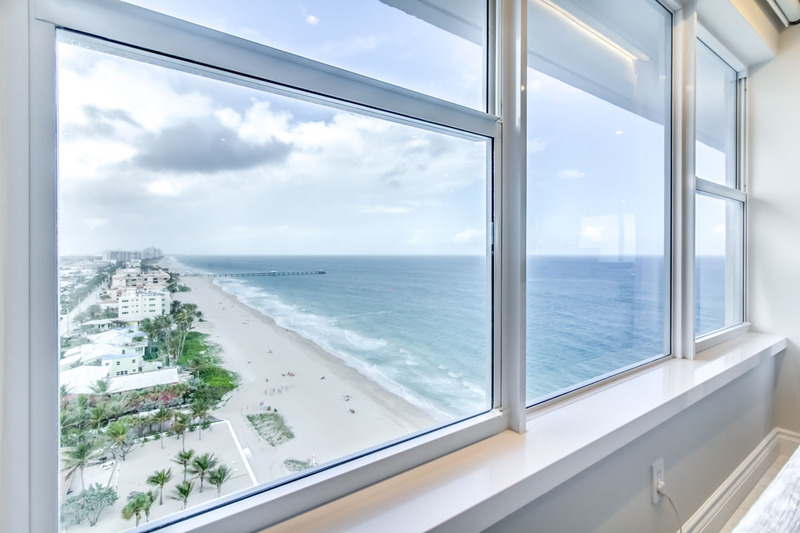 It also offers direct ocean views – and views from Miami Beach to Lighthouse Point on a clear day. 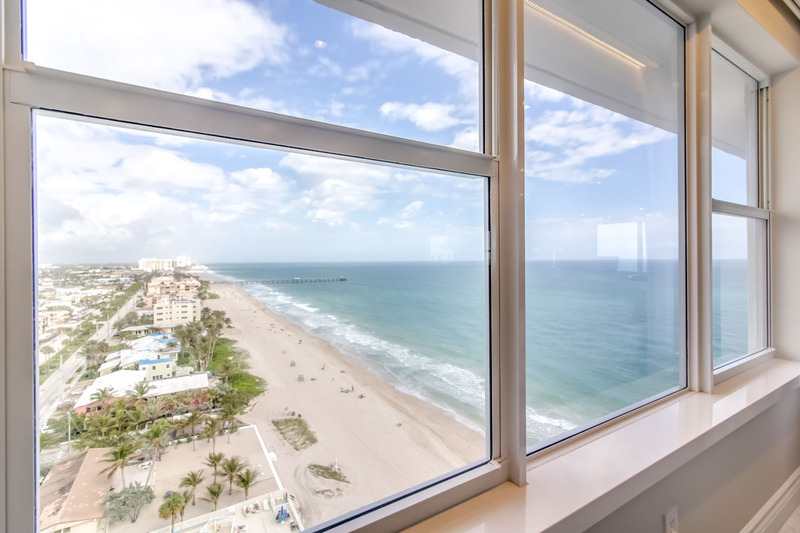 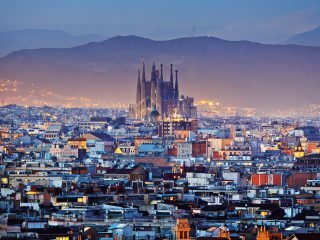 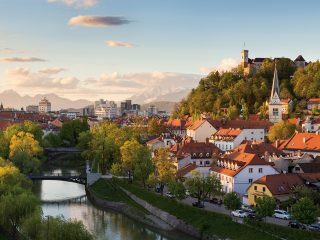 The total square footage is 3,948.68, which includes the under-air area at approximately 3,820.68 square feet and the balcony at 128 square feet. 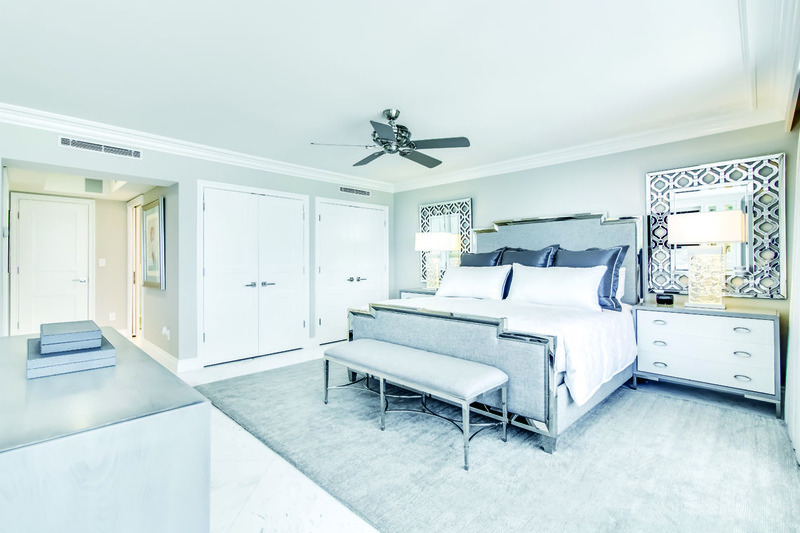 The space features four bedrooms, four full baths, library/office, formal dining room, butler’s pantry, fireplace and two garage spaces. 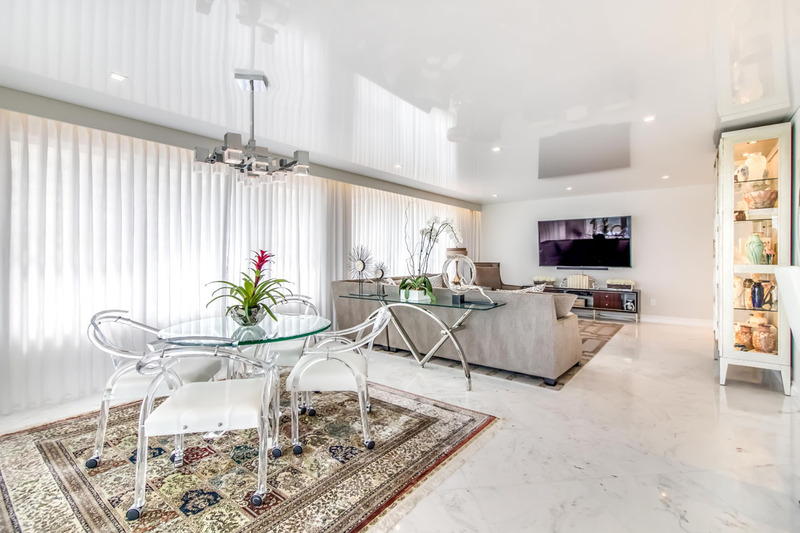 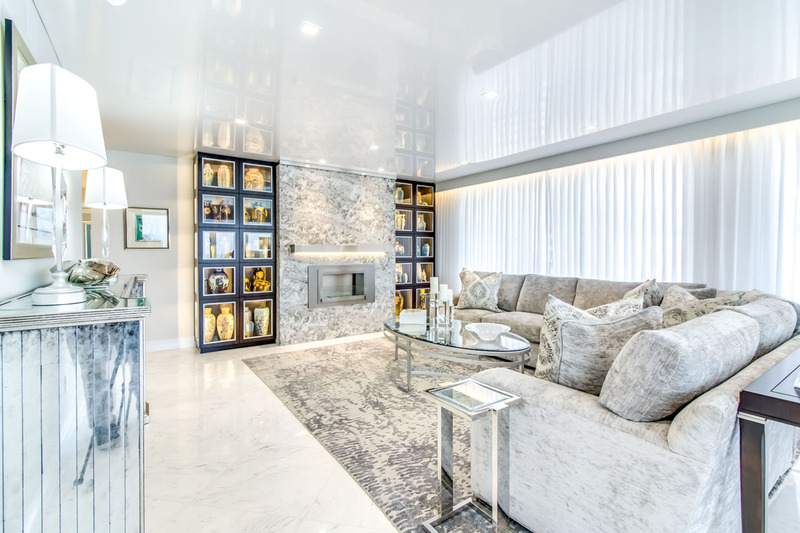 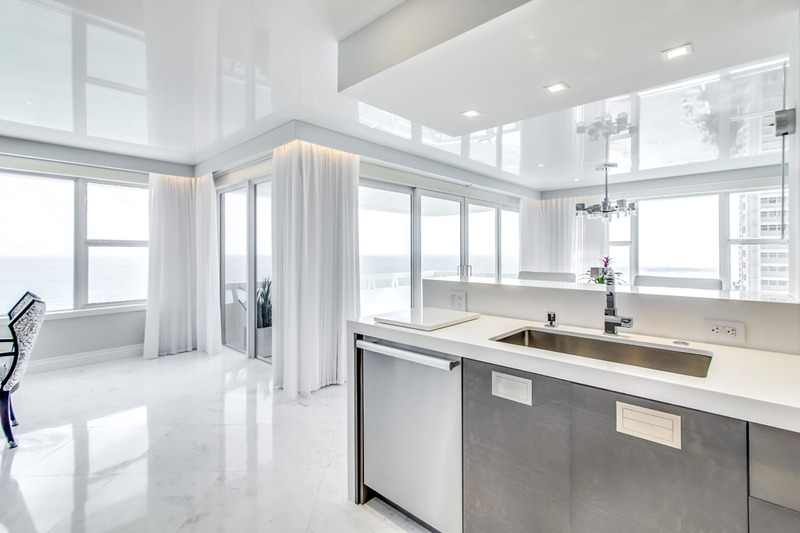 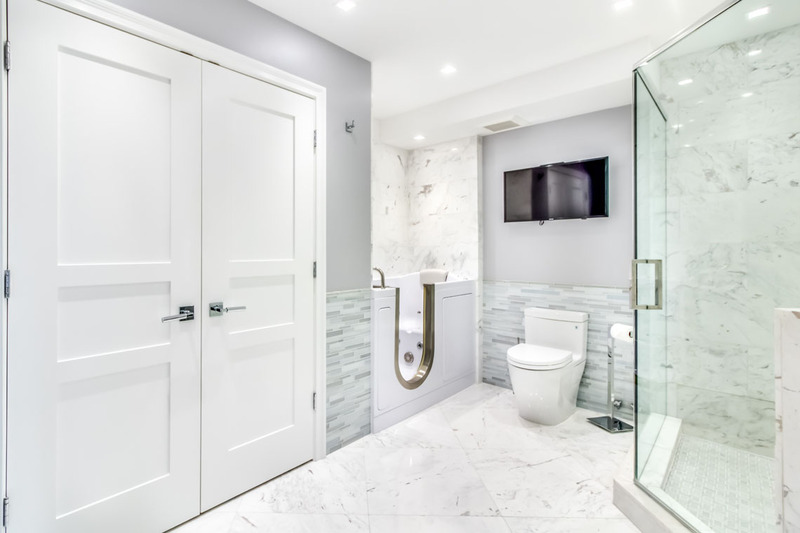 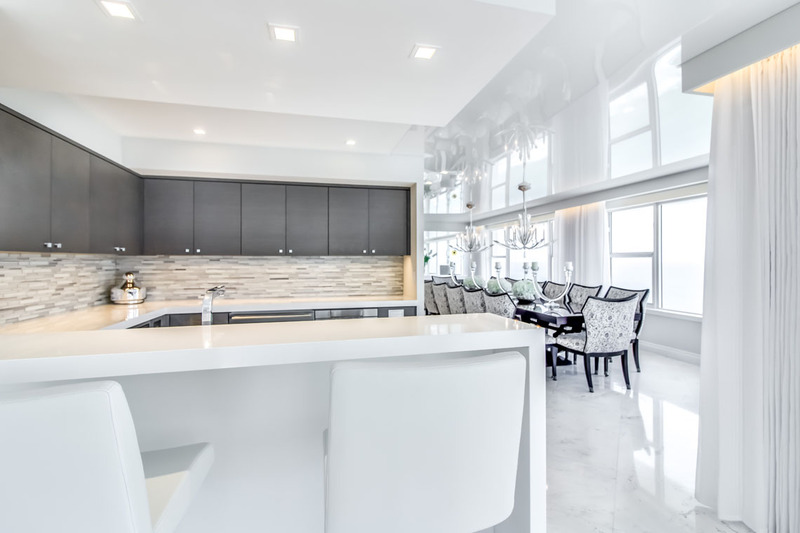 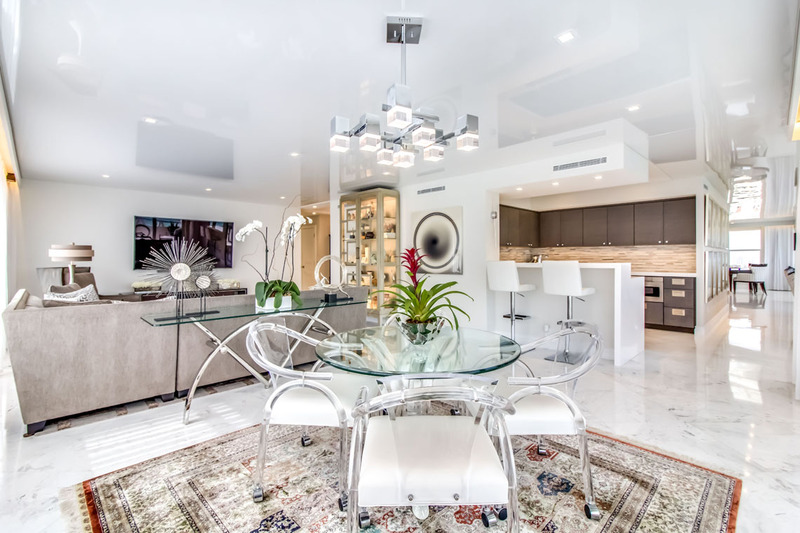 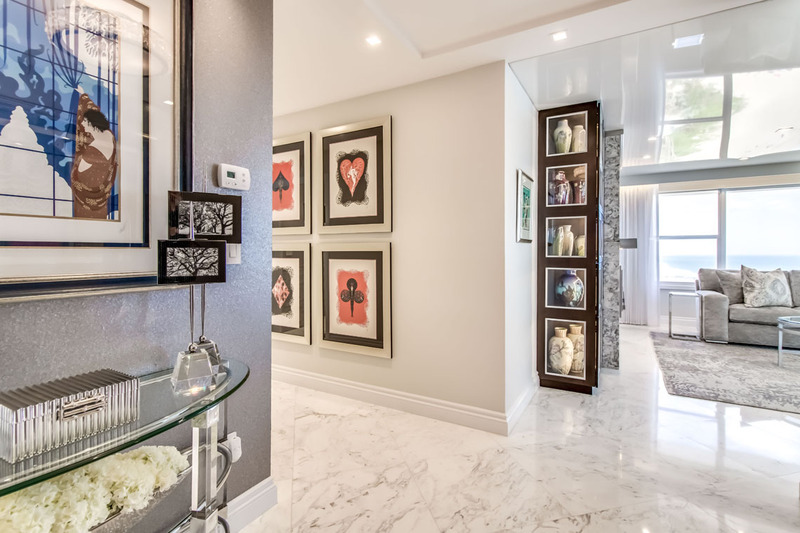 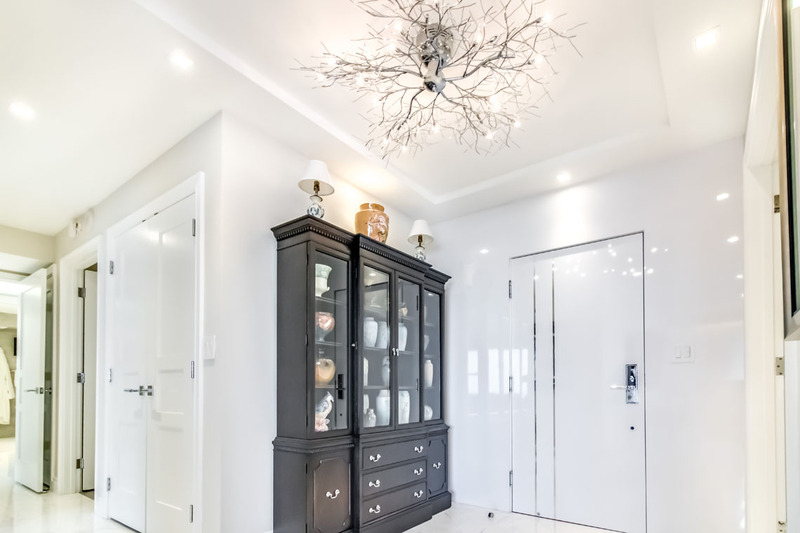 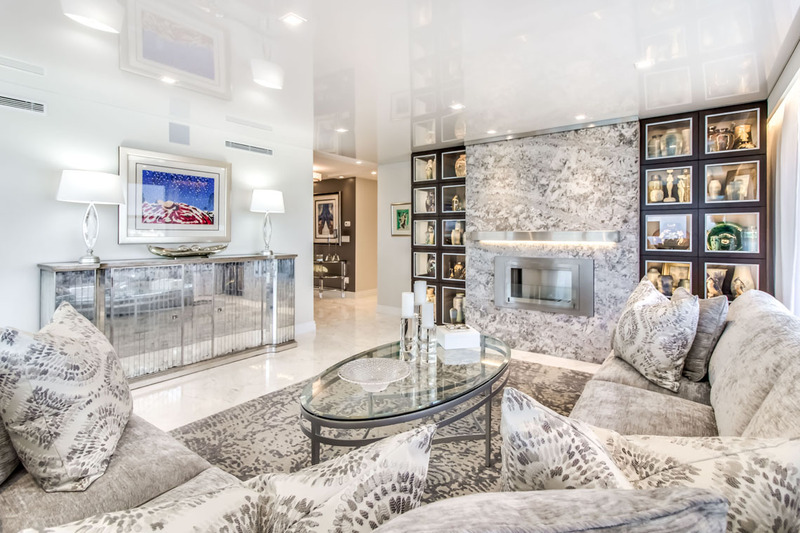 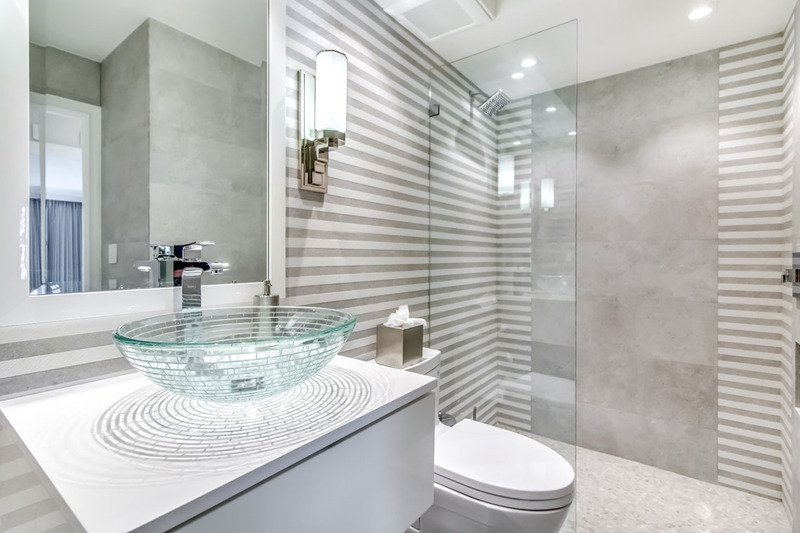 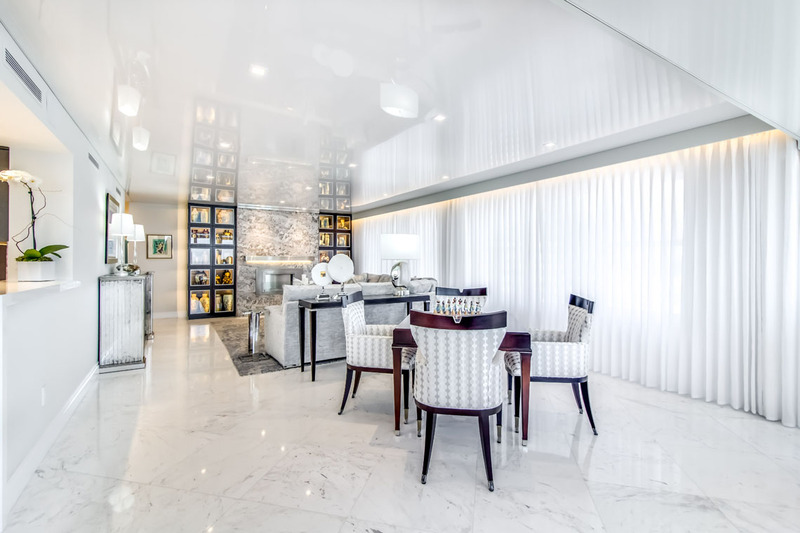 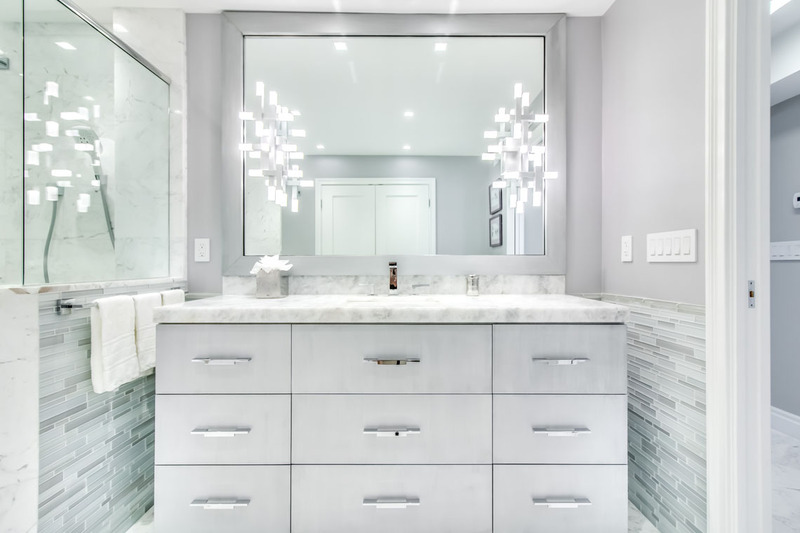 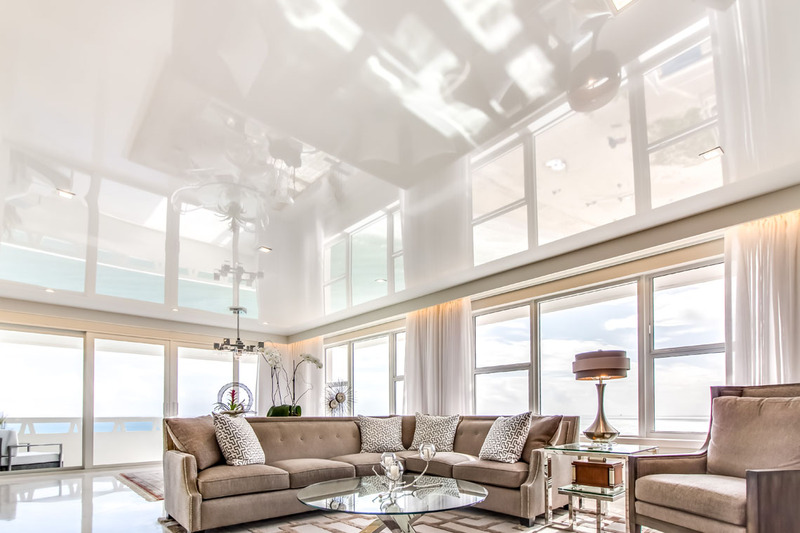 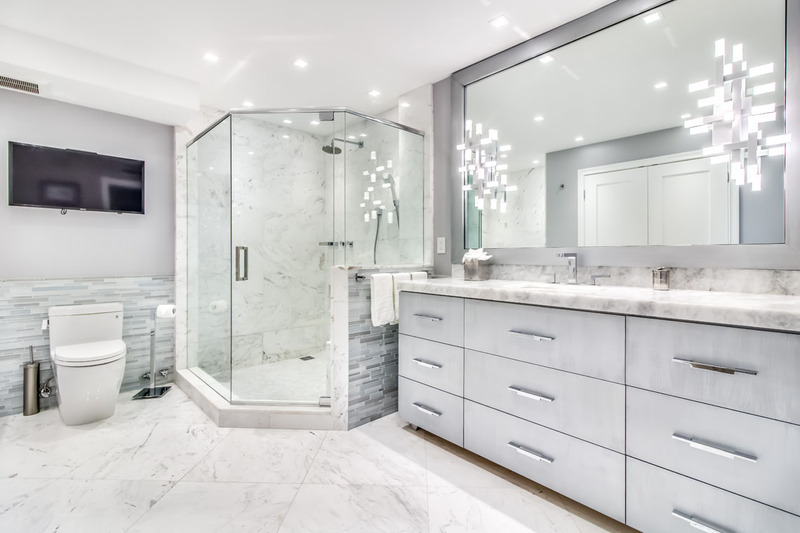 Throughout the home, custom LED lighting and Fine Art ceiling fixtures adorn the mostly white condominium. Unique to its design, the innovative white reflective ceiling mirrors the blue ocean views to expand the point at which your eye meets the skyline and palm trees. 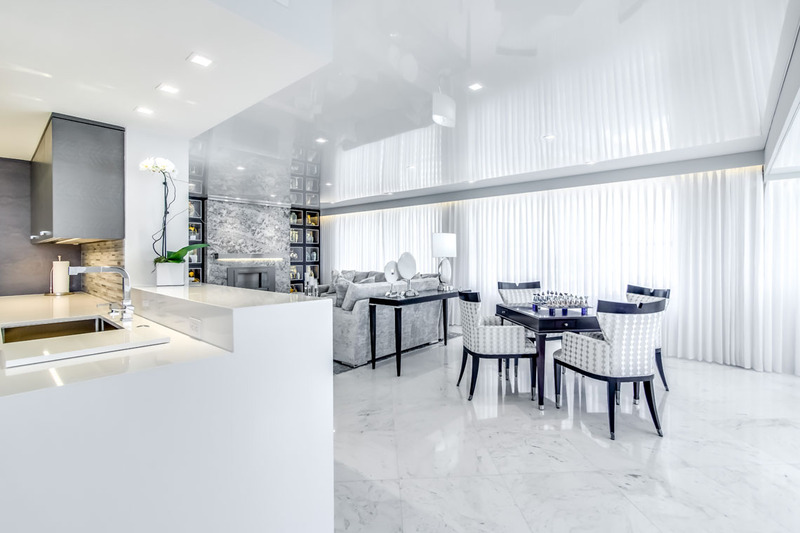 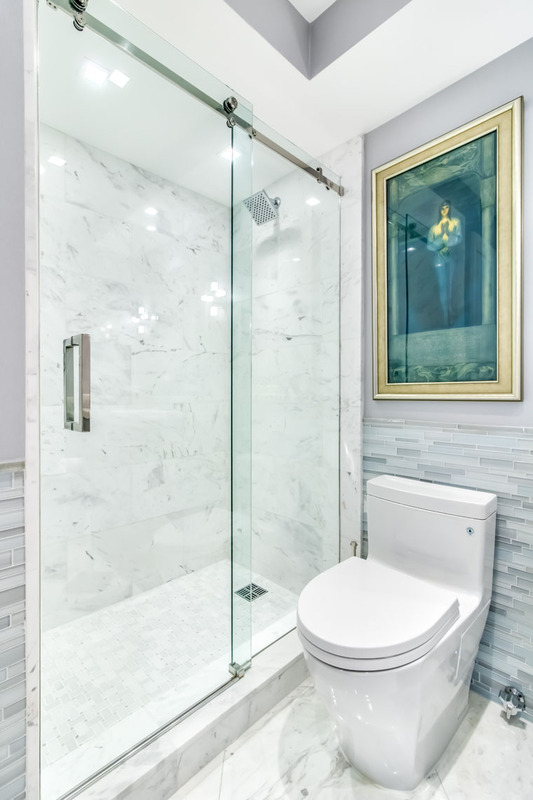 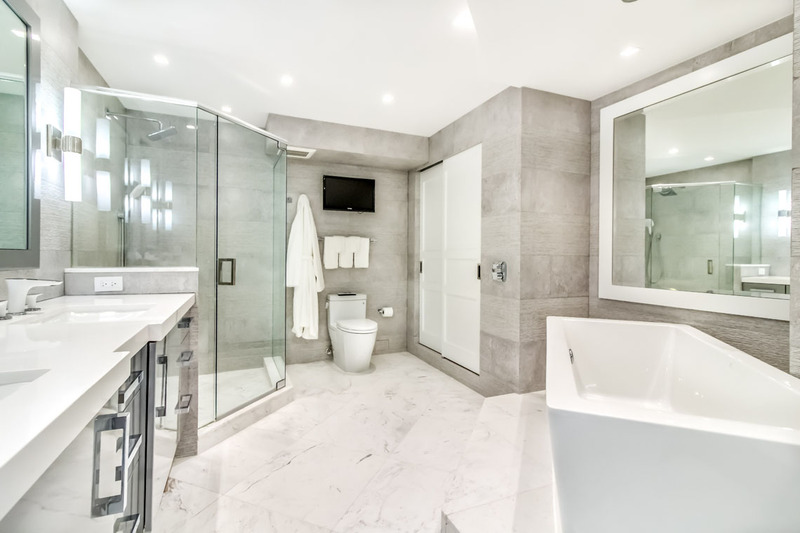 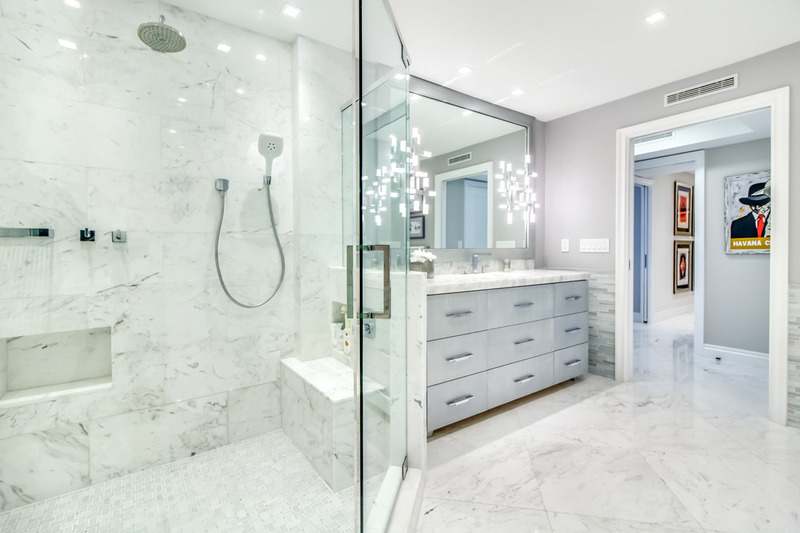 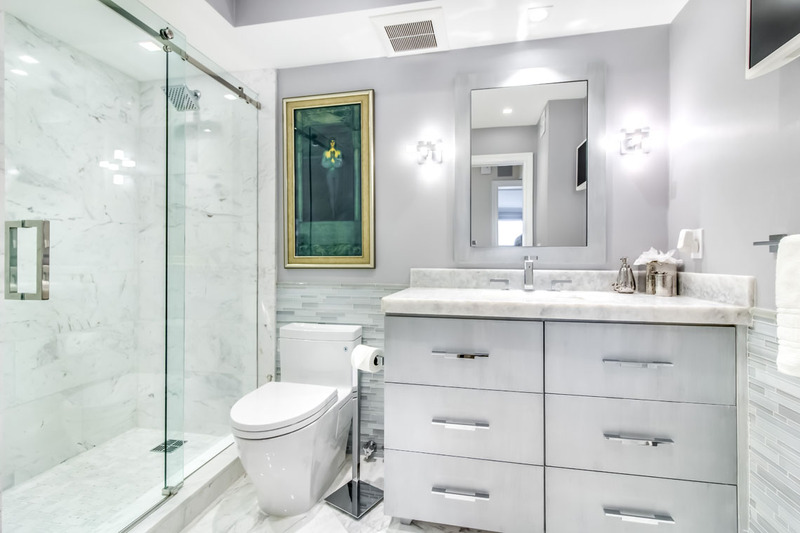 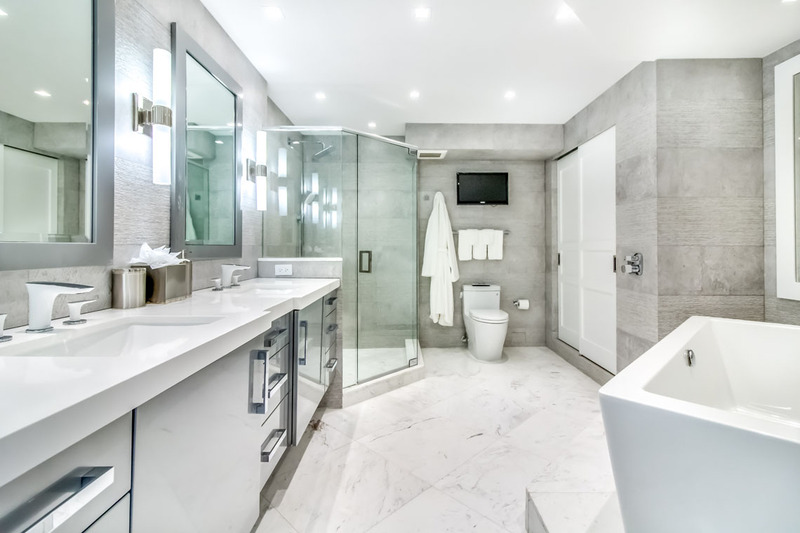 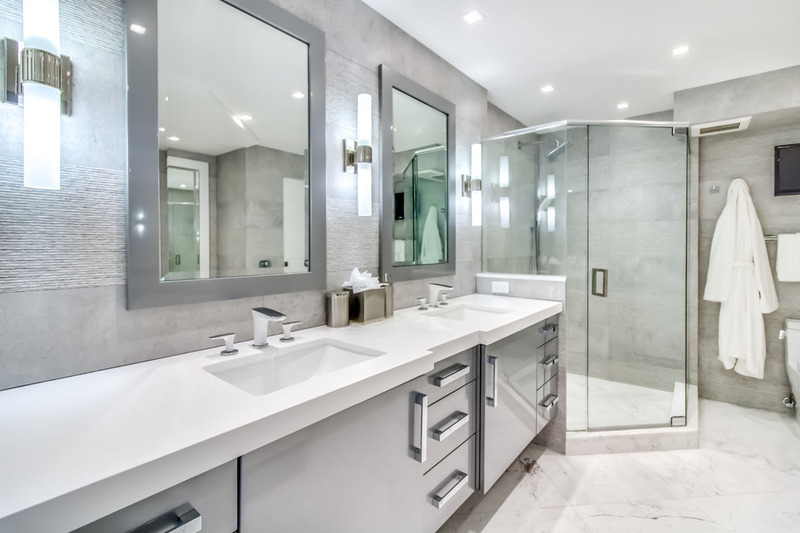 In addition, white and platinum Volakas marble is used throughout. 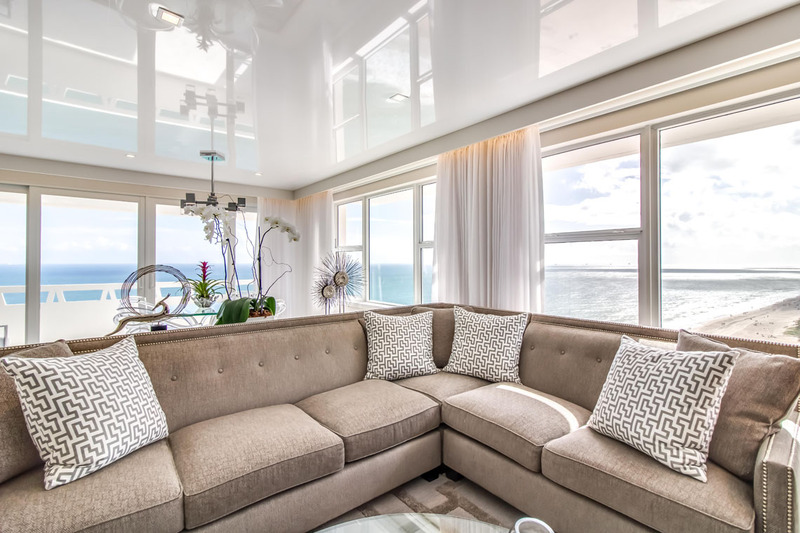 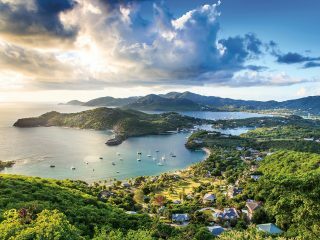 As a convenience factor, electronically controlled blackout shades, drapes and sheers have been placed in all windows and a SONOS sound system has been installed in the main living areas. 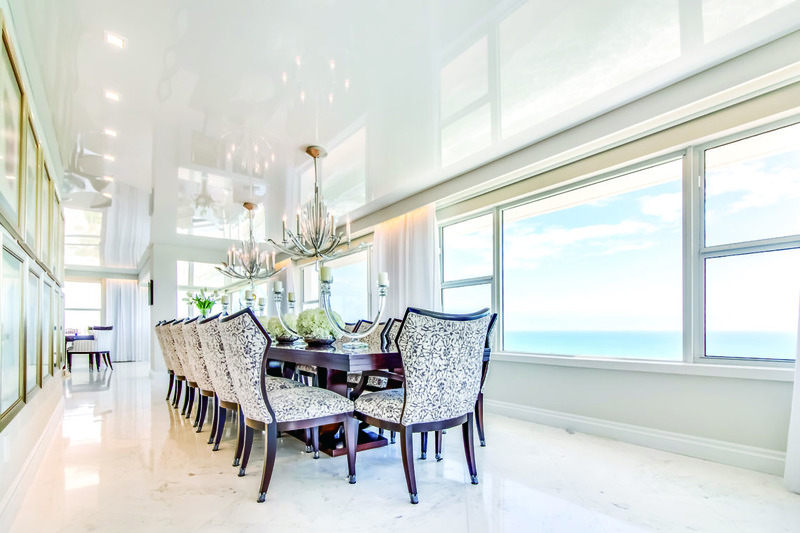 To further entertain guests, the floor-to-ceiling granite-faced fireplace warms on chilly-ocean-breeze nights. 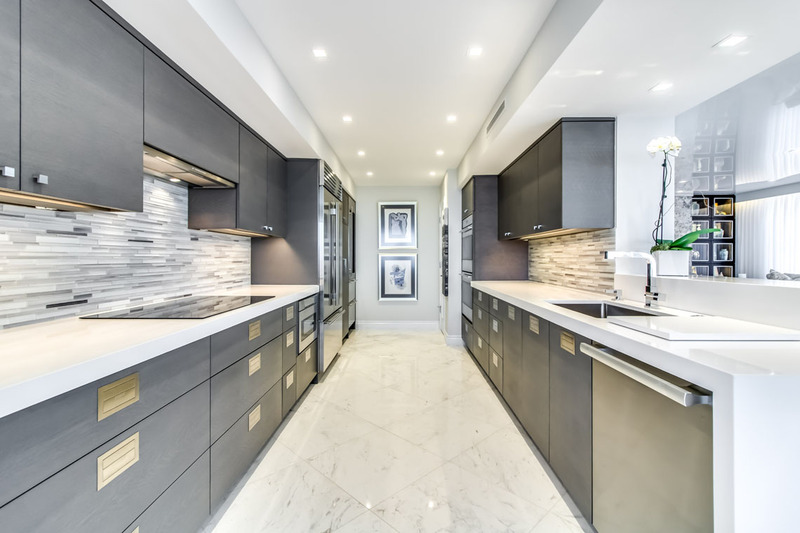 The new gourmet and catering kitchens are equipped with custom cabinetry from Kitchenworks. 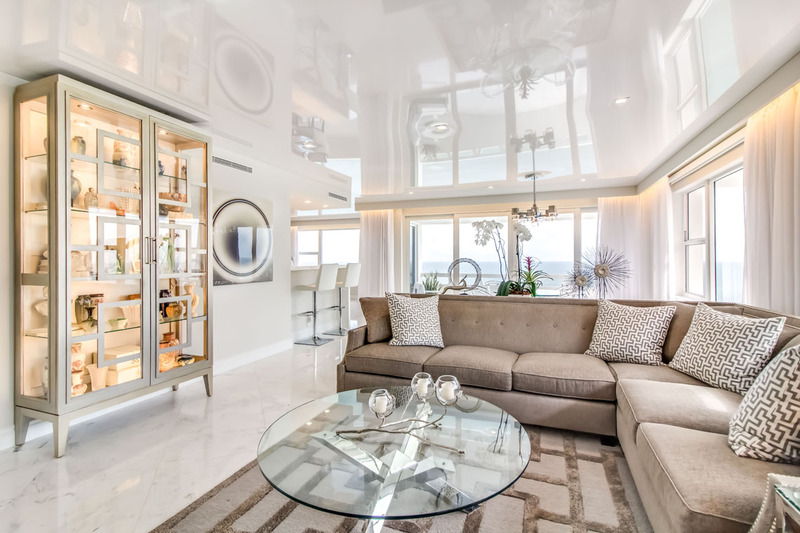 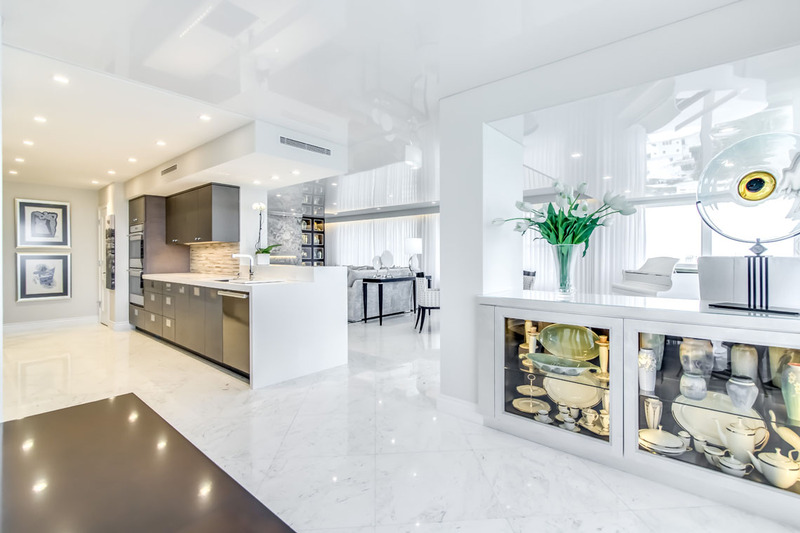 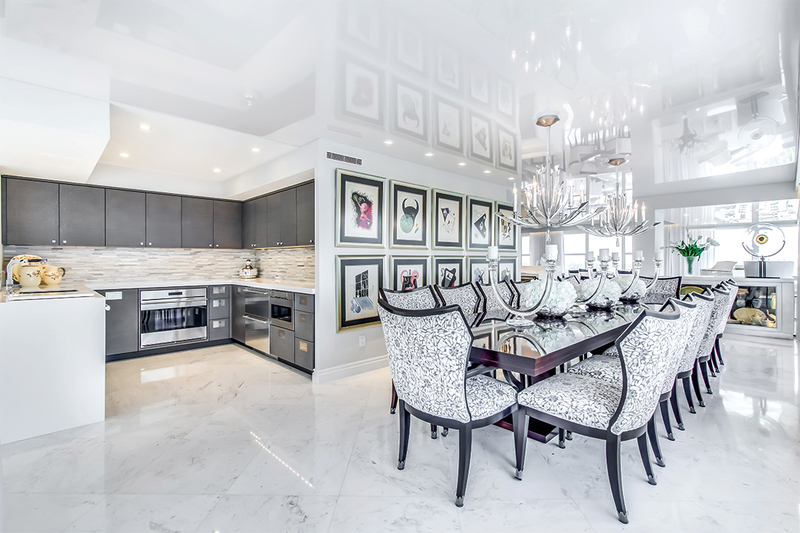 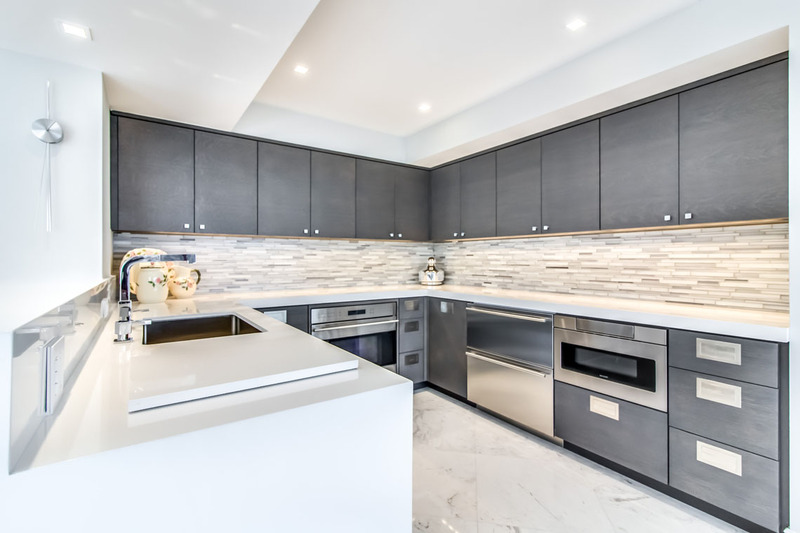 The luxury appliances include three Sub-Zero refrigerator drawers, one freezer drawer, one Wolf countertop and a Sub-Zero wine cooler that holds up to 86 bottles. 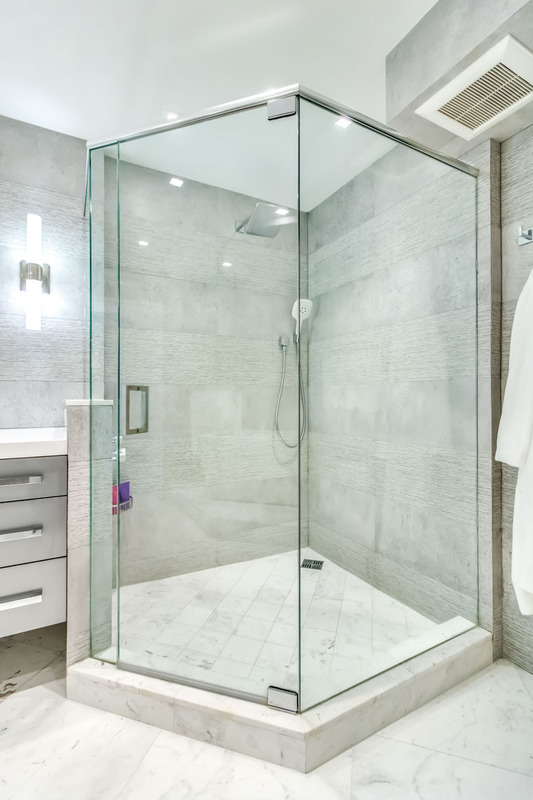 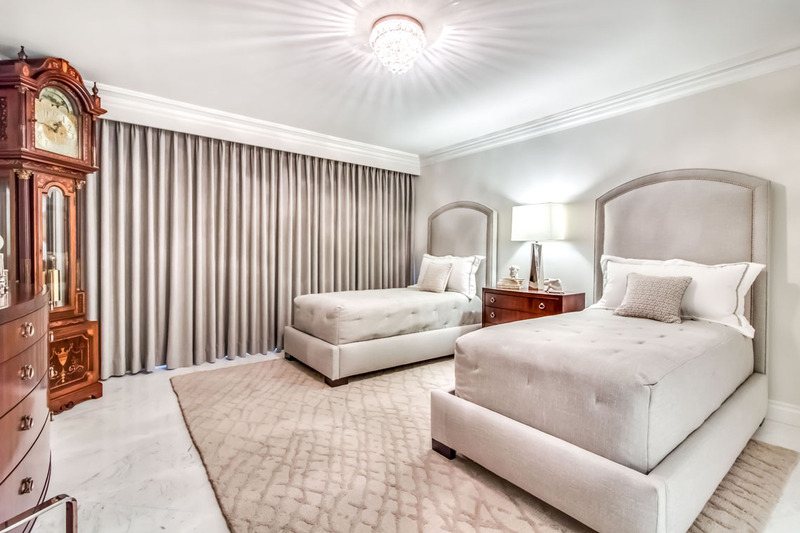 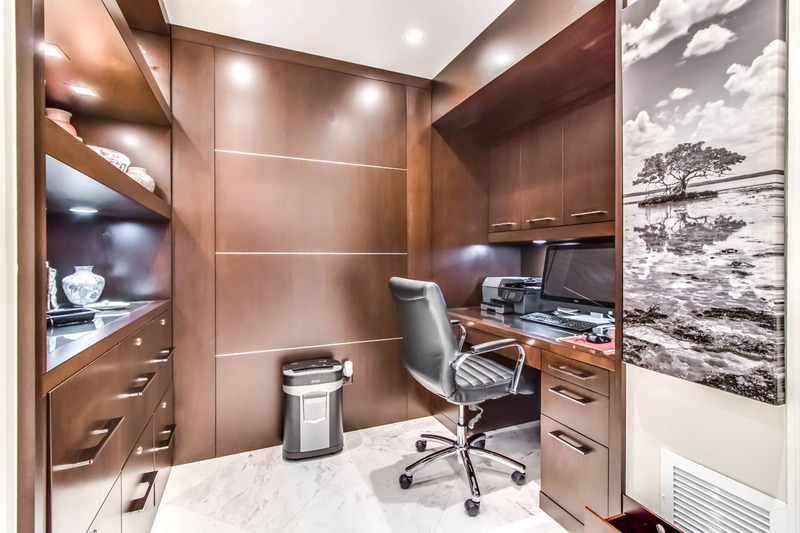 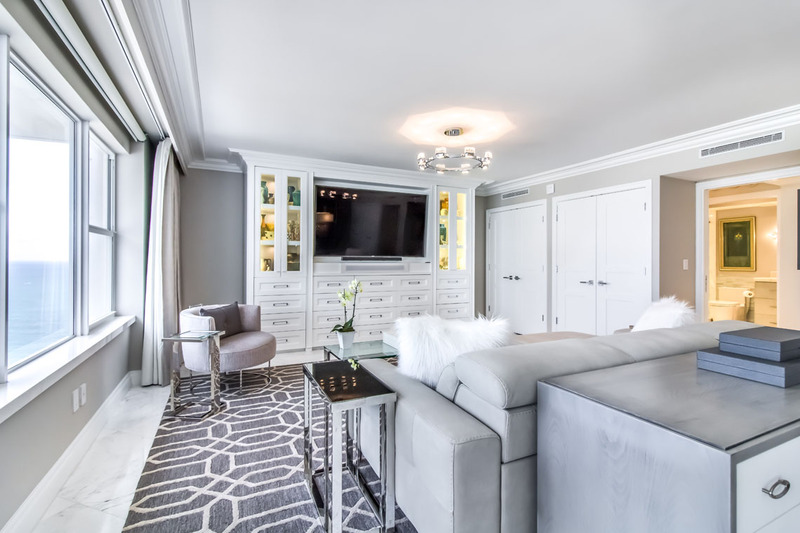 The bedrooms feature new custom closets with light sensors and electric air-freshening systems. 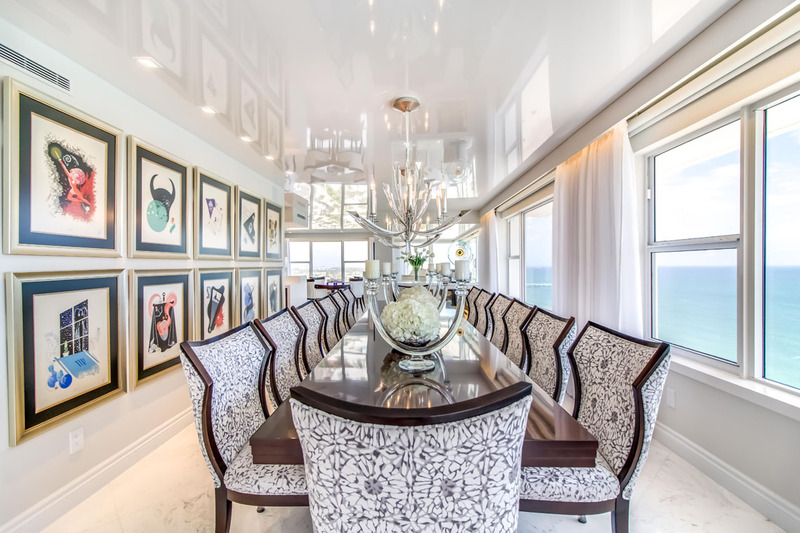 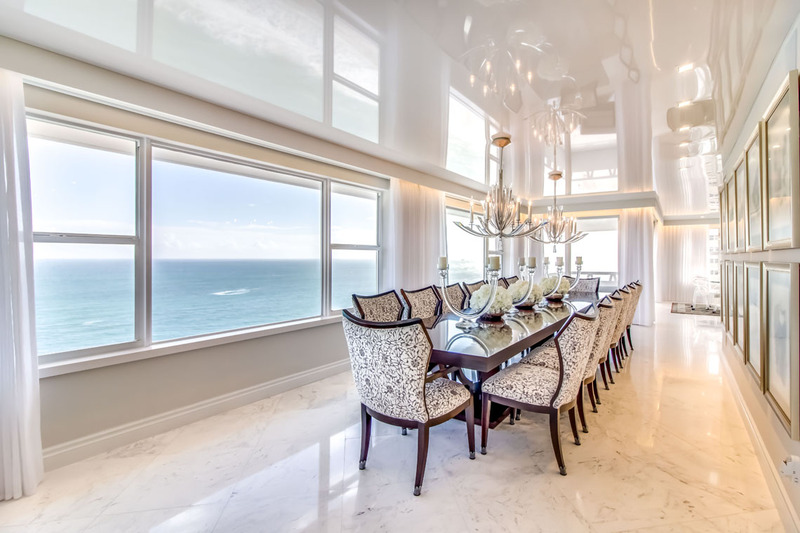 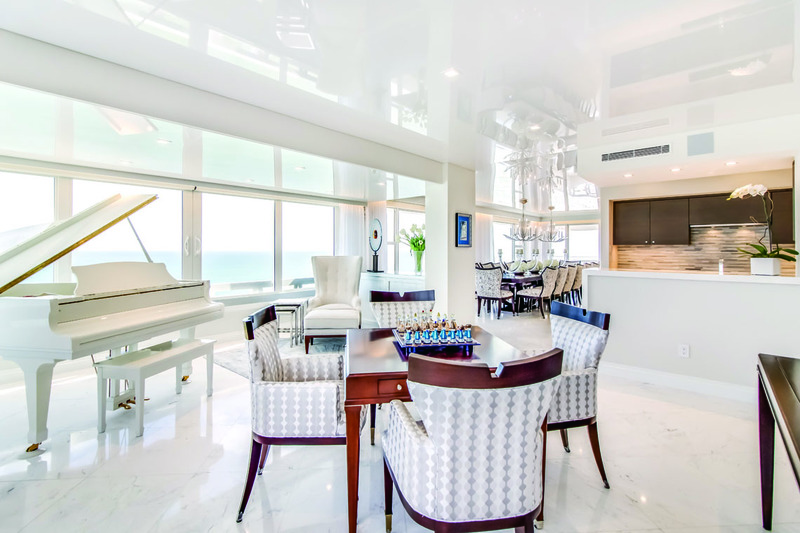 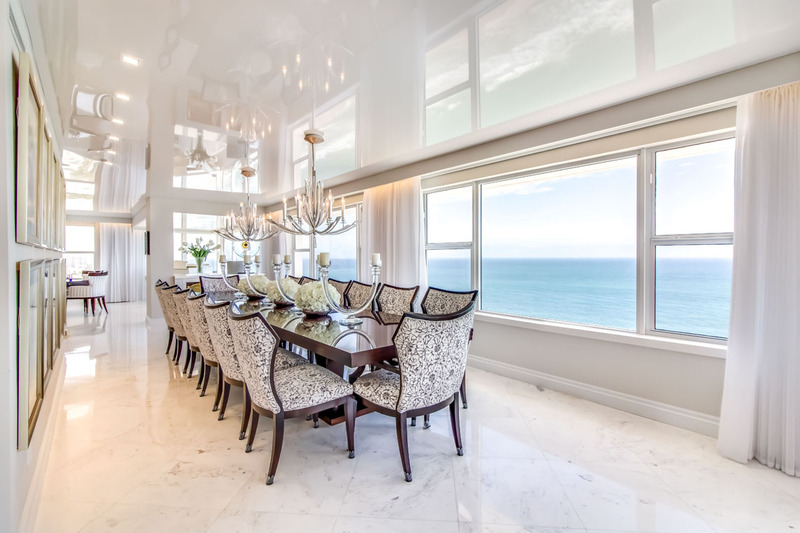 However, the real treat is the formal dining room featuring a beautiful dining table stretched across the narrow room surrounded by views of the ocean everywhere you turn. 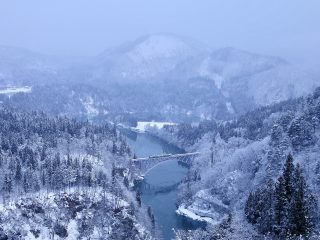 This is also the point where the two combined units meet.